Advice from Khen Rinpoche Geshe Thubten Chonyi, resident teacher at Amitabha Buddhist Centre, Singapore. These teachings offer valuable advice related to our Dharma studies and practice: how to check whether our practices are Dharma, the need for study and constant reflection on the Buddha's teachings, and how to overcome our afflictions and problems so that we can truly benefit others. Transcribed, edited and prepared for publication by the editorial team at ABC, Singapore. Daily Reflections is available as an ebook from online vendors. The purpose of engaging in Dharma practice is to remove suffering and to improve our minds. When our Dharma practice leads to suffering, then I do not see the point in doing it. Dharma practice is essentially performed with our minds and should be done willingly from one’s own side and should contribute to the removal of suffering. When one understands the purpose, one would not feel forced to practise. Instead, the practice will be done with great enthusiasm. We should not be lazy when it comes to our Dharma practice or studies. Sometimes we think, “I am getting old, I am not intelligent enough to understand this, I do not have enough time” and so forth and we put ourselves down. Thinking in this way, we are hindering ourselves from taking advantage of the opportunity for Dharma studies and practice. Because of this way of thinking, we do not study and practise and become lazy. We should not stop ourselves from our fair share of Dharma practice and studying. All of us are different. Some are predisposed towards anger, others towards mental distractions. The angry ones may think, “I am the angry type. There is no hope for me. It is impossible for me to meditate on compassion. Forget about it.” Thinking in this way, they do not give themselves the opportunity to improve. Others may think, “My mind is so distracted. There is no way I can meditate and develop concentration.” Again, thinking like this, they stop themselves from being able to change. The point here is not to create obstacles for our own Dharma practice. Instead, we should open the door to our Dharma practice and studies. We have already discussed the human life of leisure and opportunity. We should reflect on this. All the good conditions are gathered together to enable us to study and practise and we also have the ability to do so. Remembering this, we should encourage and persuade ourselves to study and practise Dharma. It is your responsibility to manage your time and to adjust your lifestyle in such a way that Dharma practice and studies can fit into your life in a comfortable and nice way without your feeling stressed. It is pointless to force and push yourself too hard. Then you become depressed and end up feeling that your Dharma practice and studies are making you suffer even more. It is pointless if you end up like that. One has to expect some difficulties when it comes to practising and studying the Buddhadharma. Everything is difficult. The moment you move your body to start doing anything, the difficulties begin. Ours is a materially advanced and progressive society. But there are also many instances of mental frustration, stress, anxiety and mental suffering. These sufferings already exist. So we should not create more suffering with our Dharma practice and studies. That is never the point. The point here is to do things at a comfortable pace. Whether the outcome of a course of action is positive or negative depends on the originating intention or motivation. A virtuous intention produces positive results and a negative intention produces bad results. Therefore, we should always rely on mindfulness and vigilance to keep our minds in a virtuous state. We assert that attending teachings is a virtuous act. However, if the motivation for listening to the teachings is not virtuous, then being present and listening to the teachings is not necessarily virtuous. A beneficial motivation would be to think, “Whatever knowledge I get in class, I am going to blend it with my mind and try to practise it as much as possible.” When we make the effort to practise, we can have positive experiences that will give us the understanding and confidence that the Dharma we are studying and practising really works. What is the result of such positive experiences? Faith in the Dharma will naturally arise and faith in our virtuous friend and guru will be generated from the depths of our hearts. The problem is that people attend but do not apply the teachings in their daily lives. When the teachings we hear remain simply at an intellectual level for us, without our practising them, it is very difficult for us to generate faith in the Dharma. We do not taste the Dharma. Without such faith, it becomes very difficult to talk about generating faith in our guru who gives us the teachings. But when we blend the teachings with our minds and try to practise them, then over time, the quality of our minds will improve; we become more good-hearted and so forth. Our faith in the Dharma and our guru also increase. Samantabhadra is not only a bodhisattva but an arya bodhisattva abiding in the grounds. Bodhisattvas like Samantabhadra made such extensive offerings in order to complete the accumulation of merit. Relying on the factor of wisdom is not enough to enable them to achieve the final goal of enlightenment, because they still have the obstructions to omniscience, and removing these obstructions require vast stores of merit. If such a bodhisattva makes such extensive offerings to all the buddhas and bodhisattvas, it goes without saying that we ordinary beings, who are bound by our afflictions, must do likewise. We need to make extensive offerings “in order to seize that precious mind” of bodhicitta. It is very difficult to generate bodhicitta especially when our minds are not purified of their obscurations and negativities. We need to accumulate the collection of merit so that the favourable conditions for generating bodhicitta can arise. Prostrating with our speech means we offer praises to the buddhas with a melodious voice. Prostrating with our minds means reflecting on the qualities of the Buddha and generating faith towards him. Prostrating with our bodies involves touching the five points of one’s body to the ground or performing the full length prostration. Our prostrations should always be preceded by reciting the prostration mantra, Om Namo Manjushriye Namo Sushriye Namo Uttama Shriye Soha. There are inconceivable benefits to doing this. By reciting this mantra, every prostration performed is equivalent to one thousand prostrations and the benefit is comparable to hearing and reflecting on the meanings of the three scriptural collections. It is said that when we prostrate continuously after reciting this mantra, we can achieve the path of seeing in this very life itself. Whether we benefit from our prostrations depends on how well we perform them, our ability to sustain our visualisation and keep our minds focussed on what we need to do with our bodies, speech and mind throughout the prostration. The quality of the prostration is most important, the quantity less so. There is much to contemplate as we perform each stage of the prostration, placing our palms on our crowns, throats and hearts. We are also advised to visualise countless replicas of ourselves when prostrating. The main thing is to generate faith in the Three Jewels. We will reap the benefits if we reflect properly during the prostration. Usually, our bodies are prostrating but our minds are distracted. Although we can still accumulate merit from performing such physical prostrations, obviously the merit we accumulate is far greater when our speech and minds are also engaged in the practice. We are performing prostrations everyday and even if we cannot do many of them at the moment, we can, at least, make a commitment to make three prostrations in the morning and at night as a daily minimum. In this way, we accumulate six prostrations every day. We should not feel this is a burdensome chore but, instead, we should contemplate and understand the benefits and prostrate voluntarily from our own side to the Three Jewels. Even with six prostrations a day, multiplied by whatever number of days we have left in this life, by the end of this life, we will have accumulated thousands of prostrations. Generally speaking, our motivation determines whether our actions are virtuous or not. When our motivation is virtuous, then our actions are also virtuous. But all actions performed in relation to the merit field or to the holy objects are exceptions to this rule. Even when we make offerings or prostrations to the merit field or holy objects with an incorrect motivation, we still accumulate a great deal of merit. This is due to the power of the merit field and the holy objects. You should therefore grasp the opportunity to rely on holy objects and the merit field to accumulate merit and purify your karma, especially those of you who really want to study the Buddha’s teachings and complete your studies. It is very difficult to complete your studies, no matter how hard you study, if you do not strive to do this. This is my own experience from my life in the monastery. There is no guarantee that those who are naturally more intelligent or who do well in their studies can complete them. Generally, those who work at accumulating merit, purifying their negative karma, and making whole-hearted requests to their gurus and special deities are the ones who make it in the end and successfully complete their studies. Those who are more intelligent tend to take things easy and do not work as hard, whereas those who are not so intelligent realise that they have to work harder. When we look at the example set by Lama Tsongkhapa in his life story, we see how extremely important it is to make requests continuously to one’s deity and to strive in accumulating merits and purifying obscurations in order to have some success in our practice, especially if we aspire to realise emptiness. Therefore, when we recite the Heart Sutra, the guru yoga of Lama Tsongkhapa, the prayer, Dependent Arising - A Praise of the Buddha and so on, we should recite them with the motivation of creating the causes for us to complete our studies and to accumulate merit. You are the dakinis and Dharma protectors. Be my constant friend and guard me from interferences. We see here that the supplication to the guru-deity is not only to be cared for in this life but also in the intermediate state and all future lives to come. In the monasteries we recite many prayers, sometimes doing so for one to two hours. The purpose of doing so many prayers is to accumulate merit for success in our debating and studies. Sometimes, we even recite the Praises to Twenty-one Taras 70 to 80 times. By comparison, therefore, what we recite in class is nothing as the duration is very short. I thought it is good to give you some perspective. There are some students who may wonder why we are reciting so many prayers and they may feel bored. There are others who think reciting mantras is more beneficial than reciting prayers. Reciting prayers is definitely beneficial. There are only two possibilities: Recite mantras or prayers or do both. When you hold the position that one does not benefit, then you have to say that the other is also useless. This is my own view on this matter. I think that reciting mantras or reciting prayers brings the same benefit. Some intelligent students may think, “I have sharp faculties. I will be able to study these Great Treatises without accumulating merit.” Such students, who focus only on studying and do not perform any purification practices or work at accumulating merit, may learn something but they will never be able to complete their studies. Instead, they will encounter many obstacles and find it difficult to understand the treatises, especially the teachings on emptiness. Then there are those who do not study at all thinking, “Studying is not important. I will concentrate on accumulating merit and purifying my negative karma. That is enough.” There is no way such people can realise emptiness without Listening to, studying and reflecting on the great treatises, especially the presentations on dependent origination. Can we realise emptiness and the meaning of dependent origination simply by making requests to the guru-deities? This is also impossible. We may supplicate our guru-deities with single-pointed faith, “Please grant me blessings to realise emptiness.” But that alone will not bring the realisation we seek. So, the three things must go together hand-in-hand: supplicating our guru-deities, studying and analysing the great treatises, accumulating merit and purifying negativities. This is what Lama Tsongkhapa did and we should follow his example. Whether we are prostrating or reciting OM MANI PADME HUM it is our responsibility to make this beneficial for our minds by doing this happily and willingly from our hearts. It is a mistake to think that studying or listening to the teachings is purely to accumulate information and knowledge, leaving our hearts and minds untouched. We have to do our own Dharma practice. We should mind our own instead of other people’s business, focus on our practice and check our progress to see how far we have been able to apply what we have learnt. Dharma should be used to check up on ourselves, not others. It is not hard to find examples of good practitioners. When we look at the examples set by the holy beings, we should be inspired to strive and pray to be like them one day. And mind, until I attain enlightenment. This is an important prayer from the Lama Tsongkhapa Guru Yoga practice we have just recited. It is important for us to think and pray that Lama Tsongkhapa is in our hearts all the time. It makes a definite difference to our sense of being taken care of by him in all our future lives by being able to meet his teachings again. Meditating on the inseparability of the great Lama Tsongkhapa at our hearts is also one of the best ways of doing the protection wheel meditation to protect ourselves from spirit harms and the different kinds of obstacles. We benefit from visualising with faith, Lama Tsongkhapa abiding in our hearts, as he embodies the protectors of the three lineages, Chenrezig, Manjushri and Vajrapani. This visualisation helps in developing a good heart since Lama Tsongkhapa is inseparable from Chenrezig. We also develop our wisdom because Lama Tsongkhapa is the manifestation of Manjushri and since he also embodies Vajrapani, it helps us to overcome our problems and obstacles. So if we do this practice with faith, we enjoy all these benefits. Furthermore, it will help us to meet Lama Tsongkhapa’s teachings again in all our future lives. There is also a great difference when we meditate on guru devotion conjoined with entrusting ourselves to Lama Tsongkhapa abiding in our hearts. This is because Lama Tsongkhapa, embodying the protectors of the three lineages, is the definitive spiritual master. Relying on him as our protector, with strong faith and with the determination to accomplish all his wishes and advice, he becomes our ultimate object of refuge. There are many different kinds of prayers we can do on top of the many commitments we may have. But it will be very beneficial if we can do this visualisation with this short practice of Lama Tsongkhapa Guru Yoga. Analysing our situation more deeply, we can understand that material wealth cannot really benefit us, even in future lives. In fact, the more we own, the more we grasp at these things, increasing our self-cherishing and attachment which only create more negative karma that will not benefit us in our future lives. Sometimes, we think, “I will definitely achieve something and I will be happier and more satisfied if I am rich in this life.” But if we profess to attach greater importance to the happiness of our future lives, then having this kind of worldly goal is incorrect. If we are concerned with this life alone, then that is a different matter. Otherwise, our goal should not be like that. Reciting OM MANI PADME HUM is just an example. We should engage in our meditation practice and daily prayers or a single recitation of OM MANI PADME HUM with the conviction and single-pointed faith that we will definitely achieve happiness in our future lives. We need to generate that faith of conviction and be happy with whatever we are doing. Rejoice that we are doing this wonderful practice. It would be very good if we can do this. The whole point of practising the Dharma is to remove suffering and misery. Some people think like this: “I am just a nobody in this life. I am poor and will probably stay that way. I will never amount to anything.” Thinking like that only brings unhappiness. Practising the Dharma is to increase whatever happy thoughts we may have. We need to know how to be happy. We should think: “Even if I do not become rich, at least now I have the opportunity to study and practise the teachings and I am creating the causes for happiness in my future lives.” We need to generate this belief, to have this faith of conviction and to feel happy doing our practices by seeing the purpose in what we are doing. In his advice, Gungtang Rinpoche is telling us to practise the Dharma because it creates the cause for our happiness. As the lam-rim says, at the time of death, only the Dharma helps. It was mentioned in the previous lesson that a single recitation of OM MANI PADME HUM definitely becomes a cause for us to experience happiness in our future lives. Gungtang Rinpoche says that amongst all the mantras, the best one is OM MANI PADME HUM and reciting it with the nyung-nä practice has skies of inconceivable benefits. His Holiness often says that reciting OM MANI PADME HUM is a very good practice. He points out that when we recite the mantras of Medicine Buddha, White Tara or Dzambala, our motivation for doing so is somehow connected to the affairs of this life. We recite the Medicine Buddha mantra for good health or to get rid of sicknesses. We recite the White Tara mantra to clear life obstacles and for longevity and we recite the Dzambala mantra for wealth. But when we recite OM MANI PADME HUM we do so solely with the motivation to benefit others and to develop a good heart. His Holiness said that it is a very good thing to recite OM MANI PADME HUM because the motivation is very good. That is why we can say that OM MANI PADME HUM is probably the best of all the mantras. Whatever we do, when it is mixed with the affairs of this life, it is difficult for these activities to be Dharma. For anything to be Dharma, it cannot be mixed with grasping at the happiness of this life. All the valid texts say the same thing. In the nyung-nä sadhana, there is the practice of the self and front generation of the deity. If you have received the Great Chenrezig initiation, on the basis of holding divine pride, you generate yourself as Chenrizig with clear appearance and you proceed with the rest of the practice. Generating divine pride of oneself as the deity with clear appearance. Seeing one’s fellow retreatants as the deity one has self-generated. In this way, there is no basis for jealousy, competitiveness, pride, anger and so forth to arise. This is the ideal way of doing nyung-nä. The motivation for doing nyung-nä should be to benefit others. The motivation should not be purely to purify sicknesses or spirit harm nor should it be to fulfil a commitment, so that one is only doing it out of obligation. Rather, the motivation for doing the nyung-nä should be to purify our minds of obscurations and negative karma in order to quickly achieve enlightenment for the benefit of others. We usually do not think in this big way but only consider limited worldly goals. But when we focus on the big picture, then all the small obstacles will be eliminated along the way, without our having to even think about them. Since the nyung-nä is a Mahayana practice, it has to be done with the Mahayana motivation of benefiting others, without any self-interest. When we have the thought, “I am doing this to get rid of my obstacles,” that is a selfish motivation. When the nyung-nä is done with such a motivation, it is questionable whether the practice is Dharma. When the motivation is insincere and does not come from the heart, the whole practice is no longer Dharma. Not only is it not Dharma, you have to spend two or three days suffering with no food and water, feeling tired and, perhaps, even generating anger. So it is very important to try, as far as possible, to have the correct motivation for doing the practice. Of course, that is not easy because our self-cherishing is very strong. But the point is to try to have a good motivation as far as possible. Relating the nyung-nä to what we have studied so far, you should take the opportunity to reflect on the faults of the self-cherishing attitude. You should investigate from every angle how your self-cherishing attitude is the source of all your unwanted experiences, problems and suffering. You should also examine how cherishing others is the source of happiness. During the nyung-nä, you can start by practising with the persons sitting on your left and right, thinking how you are all equal in the sense of wanting happiness and not wanting suffering. Even if there had been some misunderstanding or conflict in the past with these people, think: “That person wants to be happy just like me. Like me, that person does not want to suffer.” On that basis, try to remove those feelings of resentment and aversion and try to help one another. When you engage in the nyung-nä practice, you do so with your body, speech and mind. Physically, you will probably be making many prostrations. You will be using your speech to recite the prayers and mantras. When you are reciting the mantras, it is not like ordinary speech. You should remember the power and the benefits of reciting the mantra of Chenrezig. Mentally, you guard against the arising of anger and attachment for the duration of the nyung-nä. The essential thing is to do the practice, as far as possible, always with the thought to benefit others and to try to minimise the thoughts of jealousy, competitiveness and so forth. Generating oneself as the deity and also seeing the other participants as deities during the retreat means there would be no basis for anger to arise, since we should not be angry at a deity. Instead, you should cultivate mutual respect and consideration for one another. If you can do this, then the practical benefit will be that you can continue to be friends with that person even after finishing the nyung-nä. This text Geshe Thubten Soepa presents a detailed discussion in support of vegetarianism and animal welfare. Geshe Soepa composed the first of these two texts on animal rights, The Udamwara Lotus Flower in 1995, and the second, Compassion is the Root of the Teachings in 2005. They were published together in a book in 2007 by Sera Je Monastery in India. This publication is available in ebook format from the Lama Yeshe Wisdom Archive and can be freely downloaded as a pdf file. The above booklet about eating meat was read through, cover to cover, by His Holiness, the 14th Dalai Lama, Tenzin Gyatso. He told me: "It is well written. It would be nice if more equally useful texts were written for people to read". I cannot express how pleased I was at these words. I would like to complement my composition by a few questions and answers concerning the topic. Question: Don't you need some meat for the sacrificial tsog ceremony? What do you do about that? Answer: In Dza Patrul Rimpoche's lam-rim text it says: To that end it is appropriate to use meat from an animal that has not been slaughtered for eating. However, if you introduce meat that does not conform to this requirement into the mandala of offerings, all the deities and wisdom beings will vanish, that is what Gampopa said. In the autobiography of the siddha Kunleg you will find the statement: "Now, when you make offerings, you should bear in mind the following points concerning the recipient of the offerings, the offerings themselves and your motivation: Each of the Three Jewels (Buddha, Dharma and Sangha) is fit as a recipient for the offering. The object to be offered should not be associated with theft, violent appropriation or killing and the motivation should consist in the aspiration to attain enlightenment for the benefit of all beings. Offerings made in a different manner with masses of meat and alcohol are found among the earlier non-Buddhist religions, but not among Buddhists." The Dalai Lama's statements regarding this point have already been presented above. Question: What is the right approach to the so-called meat and blood tormas in protector rituals? Answer: That is evident from Patrul Rimpoche's lam-rim text. It describes the protest of Guru Rimpoche, Shantarakshita and all the pundits contemporary with the Dharma King Trisong Detsen, at the Tibetan practice of sacrificing meat and blood according to the Bonpo custom: 'If you continue this custom we shall go back to India', they said. They stopped partaking of food and refused to give any more teachings. It follows that these so-called meat and blood tormas should not be made up of real meat and blood. If you really make offerings of meat and blood, no deities and wisdom beings will come. You will only attract ghosts. As they feast on such offerings, they may become friendly and bring you short term benefits. If you then fail to continue giving them meat and blood, they will harm you. However, if you go on making offerings of meat and blood, you will be reborn among such ghosts or you will find yourself among wolves and birds of prey. That is what Patrul Rimpoche said about this topic. These so-called meat and blood tormas symbolize the ignorance, harmful intent, selfishness and self interest in one's own mind and that of others. These characteristics are meant to be visualised as tormas and offered in this form—not as external substances made up of real meat. The meaning of the secret mantra is not to be taken literally. It only opens up through an understanding of the six alternatives and four modes of explaining vajra expressions. Question: How about offerings of the five kinds of meat and nectar mentioned in the texts of highest yoga tantra? Answer: A yogi practising highest yoga tantra needs some kind of realisation substance for giving up dualistic concepts of pure and impure. As Patrul Rimpoche makes clear in his lam-rim, this also requires meat from an animal that has died a natural death and rather than having been slaughtered. As a matter of fact this is not meant for people who carelessly indulge their craving for meat, but exclusively for yogis who can transform the five kinds of meat such as dog meat and human flesh as well as the five substances like feces and urine into nectar through the power of concentration. It is not meant for people like you and me. Question: Are you suggesting that someone who has received empowerments for Highest Yoga Tantra should not offer meat and alcohol as part of a tsog offering practice? Answer: Many lamas do not really care and offer meat. However, some more considerate ones only offer meat of animals that have died from natural causes. During a teaching he gave in Bodhgaya, His Holiness stated that it is not nice if thousands of monks come together for tsog practice offering huge amounts of meat. Instead they should offer tea, water, fruit juice, coca cola and the like. Furthermore, Lama Atisha, during his stay in Tibet, used to offer molasses or honey instead of meat and milk or yoghurt instead of alcohol. Apart from that I found a quotation to the effect that Go Lotsawa was extremely pleased that many other masters i.e. Drigung Jigten Gonpo, Drigung Chenga Rimpoche, Taglung Tangpa, Pagmo Tugpa, Togme Sangpo41 used to substitute molasses or honey for meat and milk or molasses for alcohol. Question: Is it true that offering meat to a monk results in merit being accumulated and that there is a benefit for the dead animal? Answer: Gelug Shamar Pandita, tutor of the 13th Dalai Lama, said in his lam-rim text: "some people of blind faith think it is beneficial to slaughter sheep and goats for the soup of monks or the food of gurus, however, in fact it is a grave harmful act due to confusion and wrong views and it is important to be clear about this." He goes on to say in his lam-rim: "To buddhas each and every living being is as valuable as if it were their own child and to all beings, life is the most important thing. You, who dare inflict unbearable pain on such beings out of greed for a mouthful of meat, you think of yourselves as followers of the Buddha and call yourselves lamas and monks! Shame on you! You should judge yourselves harshly." Question: Monks and nuns have to accept meat that benefactors give them, don't they? After all it says that you should eat whatever you are given when going on your alms round. Answer: In Panchen Deleg Nyima's commentary on the Vinaya it says: If a monk is offered meat dishes by a donor on his alms-round, he should ask whether or not the meat has been obtained through killing. And in the commentary on the Vinaya called Rays of the Sun: "You have to ask whether or not the offering has been obtained through an action against the rules." Numerous Vinaya scriptures point out that you should make sure the gift that is being offered does not contradict the rules of monastic discipline. They also mention 20 types of meat and other foods that must not be eaten at all, even though the creature may have died a natural death, for instance human flesh, the meat of monkeys or that of vultures. Therefore, if in doubt about the origin of meat, you should definitely ask and decline anything inappropriate. Even if the gift is appropriate, it is important to ask whether eating or drinking it may have any drawbacks or deleterious effects on one's health, for instance, if you are diabetic, whether it contains any sugar etc. Apart from that, offering food containing meat constitutes impure giving: In the Sutra to Rishi Gyepa Buddha Shakyamuni taught about how the 32 types of impure giving should be abandoned and how to perform correct giving. Impure giving is divided into four categories: impure with regard to the motivation, the object given, the recipient of the gift and the manner in which it is given. In this sutra, giving meat originating from killed animals, alcohol offered to the careless, as well as weapons, poison and the like are enumerated as cases of impure giving with regard to the object. Question: In Buddhism eating meat is allowed as the Buddha himself ate meat: The cause of his death was eating poisoned pork that an evil-doer had given him. Answer: This story circulates, however, looking at statements contained in the authentic scriptures it does not seem very plausible. As far as I know there is no reliable source for it. On the other hand indications that the Buddha rejected meat can clearly be substantiated with the above passages from the Lankavatara Sutra, the sutra Vinaya Foundations of Medicine and the Angulimala Sutra. The reason why the Buddha could not easily be harmed by poison is that he did not manifest himself in an ordinary aspect. He appeared in the aspect of a buddha, both in essence and in his individual characteristics, which is why poison could not have harmed him. In the Kangyur we find a story where the householder Pelbe, belonging to a different religious group, offered poisoned meat to the Buddha, thinking he was not clairvoyant as he ate it. However, as the poison did not have any effect on the Buddha he deeply regretted his deed and confessed it. Afterwards he became a monk and attained arhatship. There are also accounts in the sutras about how Devadatta set a wild, maddened elephant on the Buddha in order to kill him, but did not manage to do so, about how he shot at him with a sling-shot, but could not do him any harm. If the Buddha had indeed been as easy to kill as a normal being, dying from swallowing poison, I think he would have hardly been able to manifest one of his 12 deeds, such as the taming of Mara. Apart from that the Hinayana presentation of the Vaibhashika abhidharma also deals with the 18 extraordinary qualities—exclusive features of a buddha's body, speech and mind—and the 43 additional ones shared with arhats and pratyekabuddhas which include the 10 powers as qualities of the mind. In this context, the term "power" implies that whoever possesses it cannot be harmed by anything and that, on the contrary, such a person will overcome everything. The Buddha could not be harmed by either mental afflictions or the four Maras and the like. As for his ability to overcome adversity, Vasubandhu makes clear in the seventh chapter of his Treasury of Knowledge that the Buddha's powers over the physical realm arise from his mental powers and correspond to them. Consequently, poison cannot do any harm to the body of a buddha. Furthermore, in the Mahayana texts we find presentations regarding the attainment of the vajra body42 from the eighth bodhisattva ground and descriptions of the vajra body itself in the mantra system. The story about harm through poison does not take all these qualities of a buddha into account. In the Buddhist scriptures of sutra and tantra, eating meat of animals that have been killed especially is rejected. If you have eaten such meat, you should try to purify the harmful effect. Question: Is food that contains meat suitable for offerings or not? Answer: If it is the meat of slaughtered animals it is not. If you offer meat that has been obtained through killing, you will be hard put to give a reason for not calling this a "red sacrifice".43 As we learn from both sutras44 and commentaries, buddhas, bodhisattvas and all those whose nature is compassion are filled with sorrow rather than joy at such sacrifices. Therefore, instead of reciting the offering prayer before eating food containing slaughtered meat, it would be better to recite the Akshobhya mantra or other mantras such as OM MANI PADME HUM and blow on the meat, as this might bring about a little bit of benefit. And try to find methods for redressing the harm caused by eating meat. The best means of purifying it is to save the life of animals. We should strive to employ any available means to benefit beings, we should pray for that intention and do anything else we possibly can. May the life of His Holiness, Tenzin Gyatso, be long. May this cause peace to spread on earth, the harmonious practice of all religions to be strengthened, the difficulties between Tibet and China to be resolved peacefully and the Buddhist teachings to bring universal benefit. May love and compassion grow. May all masters and holy beings of Hinayana, Mahayana and Vajrayana have a long life and see the fruition of all their endeavours. In particular, may Lama Zopa Rimpoche, spiritual director of the Foundation for the Preservation of the Mahayana Tradition, live long and achieve all his goals, such as the successful completion of the Maitreya Project. May all sentient beings be freed from the suffering of being killed. A commentary on Lama Tsongkhapa Guru Yoga practice by Geshe Rabten. Geshe Rabten gave this commentary on the Lama Tsongkhapa Guru Yoga practice in Dharamsala, India, in June, 1975. Translated by Gonsar Rinpoche. Edited by Dr. Nicholas Ribush and Sandra Smith. You can read an extensive commentary on Lama Tsongkhapa Guru Yoga and listen to the oral transmission of this practice given by Lama Zopa Rinpoche on the LYWA website. Read further teachings on this practice by His Holiness Serkong Tsenshab Rinpoche. A Lama Tsongkhapa Guru Yoga practice booklet, translated and arranged with additional prayers by Lama Zopa Rinpoche, is available from FPMT Foundation Store. Photo from a course at Tushita Retreat Centre, Dharamsala, India, in June of 1975, taught by Geshe Rabten and translated by Gonsar Tulku. Photo by Dan Laine. Today the teaching will be a brief discourse on the practice of guru yoga called Gan dän lha gyäi ma. Both Gan dän lha gyäi ma and the Guru Puja are guru yoga in connection with Lama Tsongkhapa. The only difference between them is in the elaboration of the words. In meaning they are exactly the same. The qualities we need to develop most are wisdom, compassion and power. The practice of this guru yoga in connection with Lama Tsongkhapa is the best method to accomplish all three. Through the practice of this guru yoga we can accomplish these three attributes of the Buddha, particularly his wisdom. Since you have all come here with the will to practice guru yoga, if you listen carefully and practice every day it will be very beneficial for you. In ultimate nature, Lama Tsongkhapa is form combined with the wisdom, power and compassion of every buddha. When Lama Tsongkhapa manifests in the wrathful form of a Highest Yoga Tantra deity, it is Yamantaka. When he appears in the peaceful form of a bodhisattva, a buddha, it is Manjushri. When he appears in the form of a human being as a master guru of many sentient beings, it is Lama Tsongkhapa. What we see on the altar is a statue of Lama Tsongkhapa. The full life story of Lama Tsongkhapa is beyond explanation. It comes in such a big volume that it cannot be finished in a few hours. Also it is not necessary at this time to give you a full biography of Lama Tsongkhapa. Lama Tsongkhapa is one with Manjushri. Therefore, the actual nature, the essential nature of Lama Tsongkhapa is the wisdom attribute of the Buddha. There are various ways of accomplishing and increasing wisdom. But this method, the practice of guru yoga in connection with Guru Manjushri is the best method. It is the supreme method for the accomplishment of wisdom. Many people think that this planet on which we live, this small Earth, is the only world, the center of the universe or the only world with beings. People may think this, but it’s not right. There are countless worlds smaller and larger than this; countless realms of beings other than this Earth on which we live. There are countless impure realms like this one, where beings are endowed with suffering; completely oppressed with suffering, karma and delusion and so forth. There are countless such worlds in the universe and also there are countless pure worlds, pure realms where beings are free from this kind of suffering. Among these pure realms, the Buddha Heavenly Abode of Tushita is one of such pure realms where beings are separate from all the gross forms of suffering and their cause and even the word suffering does not exist. But it is not the Tushita that is a few yards away [Lama Yeshe’s Tushita Retreat Centre, Dharamsala]. Generally speaking, Tushita is a deva realm. There are many different deva worlds and ordinary Tushita is one of the deva worlds. Tushita Buddha Abode belongs to and is part of the ordinary Tushita deva land but it is separate and much higher—in reality and in essence. It is in the higher realms of this Tushita of which we are speaking—the one that is separate from the ordinary deva land Tushita—that buddhas, bodhisattvas and many other beings live. They are all completely free from suffering. Of course, the buddhas are completely free from suffering, but even the bodhisattvas and other unenlightened beings are much higher and free from these gross obstacles. By the blessing of the environment itself it is easy for these beings to practice Dharma and to progress and develop their minds. Here, virtuous qualities of mind such as compassion, love and so forth are easy to generate and increase. So, it is a purely heavenly abode where the beings are free from all obstacles and suffering and endowed with everything necessary for spiritual development. Also the qualities of the Tushita pure land, such as the beautiful flowers, lakes, mountains and so forth there, are not just ordinary substantial phenomena, but manifestations of the buddha mind, reflections of the great beings who live there. The qualities of this abode are beyond the comprehension of ordinary beings. Even the sound of the leaves blown by the wind gives teachings on emptiness, bodhicitta and so forth, and the songs of the beautiful birds in the trees are also Dharma teachings. From here, in India, the direction of Tushita is to the north, high above us in space. At present, the lord of this abode is Buddha Maitreya. [Geshe Rabten points to his altar.] That painting up there is one form of Buddha Maitreya and that little statue to the left side of Lama Tsongkhapa is Maitreya Buddha. Buddha Maitreya is the lord of this abode Tushita but is not like a worldly lord, like a king or ruler of a country. He is the lama, the master of all those bodhisattvas and other beings who live in this world. He is constantly turning the wheel of Dharma for the sake of the beings who live in Tushita and the other bodhisattvas who come there from other worlds to receive the nectar of Buddha Maitreya’s teachings. At present in this world in which we live, the Dharma of Buddha Shakyamuni is still flourishing. But this will gradually degenerate and completely end, after which a new era of Dharma will start. That will begin by Buddha Maitreya appearing in this world. Lama Tsongkhapa is, in one way, as I explained before, the combined form of all the attributes of Buddha Maitreya in nature. But at present, he is in Tushita in the form of a bodhisattva called Jampel Nyingpo, remaining there in that form as a chief disciple of Buddha Maitreya. Also, Lama Atisha is also there place in the form of a bodhisattva called Namkha Trimame, another chief disciple of Buddha Maitreya. But although Lama Sumati Kirti [Losang Dragpa, that is, Lama Tsongkhapa] is in Tushita at the feet of Buddha Maitreya, as disciple, as prince of the devas there, other manifestations of him are also in many different forms in many different worlds. Even in this world, there are countless forms of Lama Sumati Kirti helping sentient beings. There are many scriptural sources, stories and reasons to prove that Lama Tsongkhapa is presently with Buddha Maitreya, but I won’t explain them at this time as it would take too long. Practicing the guru yoga of Lama Tsongkhapa is of great benefit because it establishes a great relationship with Lama Tsongkhapa, Manjushri and Buddha Maitreya as well. It becomes a preparation for us to be able to reincarnate at the feet of Buddha Maitreya when our present life ends and continue towards accomplishing our goal in Tushita. When practicing this guru yoga, we invite, or invoke, Lama Tsongkhapa from the heart of Buddha Maitreya. I will explain from the beginning what we must do in this guru yoga, including the preparation. To practice this guru yoga you should first clean your place, the environment in which you are going to meditate. Then, if you have a thangka, statue or picture of Lama Tsongkhapa to serve as a base, or an object, of your meditation, that would be highly beneficial. At the front of that you should arrange all your offerings nicely; place everything in a pure, proper and correct way…the water offering, flowers, incense, light, fruit and so forth. Then sit facing the altar and begin your practice by inviting Lama Tsongkhapa from Tushita from the heart of Buddha Maitreya and then make the offerings, prostrations and the following limbs. However, it is not enough just to invite the deity; you must also make certain preparations from within yourself. The best such preparation is to take refuge in the Triple Gem and generate bodhicitta. I will not explain refuge and bodhicitta in detail because I have already explained these in previous teachings. We should recite the above verse three times, not only repeating the words but contemplating the meaning deeply. There are two purposes of meditation. One is to purify all obstacles and interferences; the other is to grow and develop all the inner qualities. Blessing of the environment—preparing the pure ground, or place, for your meditation—symbolizes purification of the obstacles, all inner roughness. Making infinite offerings to the buddhas symbolizes infinite development of all inner qualities and richnesses. Now, the actual visualization of this guru yoga will be explained according to this illustration. If you can find such a picture it will be beneficial. The place above Lama Tsongkhapa is the Tushita abode, the abode of Buddha Maitreya. The actuality of this abode is beyond painting or drawing, but to symbolize this actuality we see some radiance, clouds and things like that around the palace. The Tushita pure land is not dependent on the light of the sun or moon. It does not have to be illuminated by some other astrological body; it is illuminated by the radiance of the beings that live there. The central figure in Tushita is Buddha Maitreya. He is shown demonstrating the Dharmachakra mudra, the gesture of turning the wheel of Dharma. He is not sitting cross legged but on a chair. The significance of this special position is that it shows that he is prepared to get up soon—he is not fully relaxed, settled or firmly seated; he is just about to get up and come into this world as the successor of Buddha Shakyamuni. Showing the Dharmachakra mudra means that he is constantly turning the wheel of Dharma for the benefit of sentient beings, now and also after life in this world. There are also some other smaller figures to each side of Maitreya Buddha: Atisha and Lama Tsongkhapa’s Nyingma lama, Lhodrag Namkha Gyeltsen. These are the chief disciples and there is also a great assembly of bodhisattvas and many other beings surrounding Buddha Maitreya, receiving Mahayana teachings from him. After taking refuge, generating bodhicitta, purifying the place, blessing the offerings and so forth, we begin the actual guru yoga by inviting Lama Tsongkhapa from the heart of Buddha Maitreya. This is the invitation. Ganden is Tushita in Tibetan and lha gyä literally means the hundred devas of Tushita, “hundred” being not literal but meaning very many buddhas and bodhisattvas. Gön means lord, or savior. So, the one who is the lord of the hundred devas of Tushita is Maitreya Buddha, who is lord not in the sense of a worldly lord leading a country but in the sense of being the spiritual master, leader or guide of all those beings. When we meditate here, it’s not that we are inviting Lama Tsongkhapa with strong devotion but up there, Buddha Maitreya and the others are paying no attention to us and just keeping themselves busy with whatever they’re doing. It’s not like that. The way we should meditate is that they are all paying full attention to us, completely involved with what we’re doing. All the bodhisattvas, and Buddha Maitreya in particular, are looking directly down at us with radiant smiles, with much affection and love, looking at us, ready to help. Thug ka nä means from the heart. This is where Lama Tsongkhapa comes out from. First a pure white radiant cloud, which is in the nature of compassion, emanates from Buddha Maitreya’s heart, or holy mind—the love that Buddha Maitreya has for the sentient beings of this world. It is not just an ordinary cloud but one with deep meaning, symbolizing the purity and perfection of his great compassion. It should be as white and radiant as possible and very thick, like a heap of fresh, white curd. The thickness of the cloud symbolizes Buddha Maitreya’s strong love and compassion for sentient beings. It springs out and rolls down and remains there in front of us. If you meditate and practice seriously, you sit quietly in your room, read the words slowly, then visualize as clearly as possible with all your effort. The cloud rolls down and stops in front of you. At its end there is a large heap of cloud. This is like preparing the way and the seat. In front of you there are three big heaps of clouds. On the central cluster is a golden throne decorated with precious stones. To each side of it there is a lower, smaller throne. The golden throne is supported by eight lions and on it are a lotus and a moon disk. Then, after visualizing this cloud, when we recite the last two lines of this verse, Lama Tsongkhapa and his two chief disciples, or spiritual sons—Gyältsab Rinpoche and Khädrub Rinpoche—emanate from the heart of Buddha Maitreya. Lama Tsongkhapa is an emanation of the wisdom of all the buddhas; Gyältsab Rinpoche is an emanation of the compassion of Maitreya; and Khädrub Rinpoche is an emanation of the power of Maitreya. These three, master and spiritual sons, come down on the white cloud. They spring forth instantly and come down effortlessly, without any difficulty, like being completely tired after a long journey with heavy luggage on their backs; not like that. They come down instantly, suddenly; spontaneously. Lama Tsongkhapa and his two chief spiritual sons are one in nature, but when the compassion of Lama Tsongkhapa takes form it is on his right side as Gyältsab Rinpoche and when his power takes form it is on his left side as Khädrub Rinpoche. But all three are one in nature. Therefore, when we practice this kind of guru yoga it helps us accomplish all three attributes of the Buddha: wisdom, power and compassion. Lama Tsongkhapa is called the king of Dharma not because he is some great monarch who rules over many subjects but because he is an emanation of the wisdom of all the buddhas. Fully accomplished wisdom is that which rules over all of Dharma. Therefore, Lama Tsongkhapa is called the king of Dharma. It is similar when he is called omniscient. In Tibetan, kün khyen means one who knows all—because Lama Tsongkhapa is an emanation of the wisdom of all buddhas, he is omniscient. Nothing is hidden from the Buddha mind. Losang Dragpa (Skt: Sumati Kirti) is his human name, his Dharma name as a human being. So, we are requesting the assembly of all three, master and spiritual sons, to come down and remain in front of us. The actual way to accomplish wisdom, the method to employ, comes at the end of this guru yoga, where the guru mantra of Lama Tsongkhapa is recited. This second verse is the request to always remain in front of us. The jetsun lama smiles with delight. I beg you to abide for a hundred eons to increase the teachings. Dün gyi nam khar means in the sky, or space, in front of us—about two meters; not too high, not too low, but about the level of our forehead. At that spot there is the heap of cloud, which is in three parts, as explained before. On the center one is the golden throne with lotus and moon disk. On top of that sits Lama Tsongkhapa. On each side of the main throne are two smaller golden ones, also with lotus and moon disks, on which are seated the two chief disciples. These golden thrones are supported by lions. Actually, they are lions in appearance, but in nature they have the quality of the enlightened mind. Among animals, the lion is king; the victorious one who is not afraid of any other animal. The throne of the lama is supported by four lions, which symbolize the four great qualities of the buddha mind called the four fearlessnesses. On each golden throne supported by four lions is first a lotus disk, or seat, whose nature is Lama Tsongkhapa’s fully accomplished renunciation. On top of that is a moon disk, or seat, whose nature is Lama Tsongkhapa’s fully accomplished bodhicitta. On top of that sits Lama Tsongkhapa, who himself is in the nature of wisdom, the fully accomplished right view of shunyata. Thus, these three—lotus, moon and lama—symbolize the three principal aspects of the path. The words in this practice are very simple and easy to read but have extremely profound meanings. Just the words je-tsün lama are highly significant. Je signifies the path in common with the small scope; tsün signifies the path in common with the medium scope; lama signifies the path of high scope. Lama Tsongkhapa, by practicing all these three stages of the path and gradually accomplishing them, finally accomplished the state of buddhahood. Gye päi dzum kar chän means smiles radiantly with delight, with a radiant delightful smile, which means that Lama Tsongkhapa and his two chief disciples, the three lamas, are looking down on us, not in an unhappy or displeased way but in a radiantly smiling way full of compassion, love and affection. The way the lamas look at us delightedly rather than unhappily is an auspicious preparation for our always being able to please our lamas and never disappoint them and have a close relationship with them. Dag lo dä päi means the faith and devotion of our mind; expressing the strong faith in and devotion to our lama in our mind. Out of strong devotion we want to accumulate great merit in connection with our lama. The supreme field for accumulating merit out of devotion is the lama, therefore, we request Lama Tsongkhapa to always remain so that we can create merit in the highest possible way. Tän pa gyä chhir käl gyar zhug su söl. Apart from acting as the supreme field for accumulating merit out of devotion, there’s another reason for asking the lama to abide, which is for the dissemination, or flourishing, of the Dharma in the ten directions. For that purpose we also request you, the jetsun lama, to remain for a hundred eons (Skt: kalpa). Since the flourishing of the Dharma and the happiness of sentient beings is the supreme request, there is no request superior to it, therefore, in this particular practice, it is placed here first. Generally in the seven limb puja, the request for the long life of the lama or the buddhas is the sixth of the seven limbs. But here, because it is such an important request, it is explained first of all. As I explained before, the most important object—the Triple Lama—is visualized front and center, but also, all of space surrounding the lamas is filled with clouds of offerings, as we visualized at the beginning. So, when meditating on this, we visualize in space many offering deities—many offering gods and goddesses holding various offering objects—on the clouds to either side and above the three lamas. Your holy mind understands the full extent of objects to be known. Your eloquent speech is the ear-ornament of the fortunate ones. Your holy body is glowing and glorious with fame. To you, who is meaningful to see, hear and remember, I prostrate. Next, following the usual order of the seven limb puja, which here we are offering to Lama Tsongkhapa, comes the limb of prostration. We prostrate to the lama by expressing the qualities of his body, speech and mind. Usually when we prostrate to and praise the body, speech and mind of the Buddha, we do it in that order—body, speech and mind—but in this guru yoga, mind comes first, then speech, then body. We start with mind instead of body because in essence, Lama Tsongkhapa is, in nature, the wisdom of the Buddha; wisdom is the essential aspect of the enlightened mind. Therefore, instead of body, we first praise the buddha mind, the mental quality of the Buddha, of the lama. She jäi khyön kün means the entire extent of knowable objects, everything that exists; jäl wäi means to realize or cognize. So the entire extent of knowable phenomena is realized or cognized by what power? It is realized by the power of the buddha mind, the omniscient mind of the lama. The second line of this verse praises the qualities of Lama Tsongkhapa’s holy speech. Käl zang na wäi means the ear of the fortunate ones, those who have received the opportunity to practice Dharma in general and the Mahayana in particular. People who have the great fortune of following and practicing the Mahayana Dharma are the most fortunate ones. This ear ornament, gyän gyur, is not an ornament like the earrings Indian women wear. The true ear ornament of the fortunate is not material but is the eloquent speech, leg shä sung, the teaching of the Buddha that is well explained, vast and profound. This is the true ear ornament of the fortunate. When the fortunate ones, those who practice the Mahayana Dharma, hear a teaching of the vast and profound Buddhadharma, it pleases their ear sense. Therefore, it is called an ear ornament. If that’s true for the Mahayana in general, what need is there to specify the teachings of Lama Tsongkhapa? They are unbelievably deep, profound, vast and clear; not indecisive, but extremely decisive and definite. They dig the depths of the Buddha’s teachings and make them clear. In Tibet, the Dharma masters used to say that if you’re undecided about the meaning of a teaching, look to the teachings of Je Tsongkhapa, because they are so decisive. The next line praises the qualities of Lama Tsongkhapa’s holy body. Because of his omniscient mind and eloquent speech, as explained before, he became extremely famous in the Land of Snows, Tibet, for the glory of his being. Everybody praised him. Since Lama Tsongkhapa came along later, he did not go to India to receive teachings from the Indian masters, but there’s not a single part of all hundred volumes of teachings of the Buddha in the Kangyur that Lama Tsongkhapa didn’t study and learn. There’s no way to explain in just a few words Lama Tsongkhapa’s qualities. If you are interested you can read his extensive biography, which explains in his life in great detail. Not only was Lama Tsongkhapa extremely learned in all the texts but he was also highly realized, having gained many great inner experiences through the practice of tantra. If you are really interested, you can read another biography called In Praise of the Sacred Life: the Story of Lama Tsongkhapa, which makes all this very clear. If you can receive teachings on that text it will be evident. What I am giving here is just a very simple introduction. If you want to know these things more deeply, you’ll need to receive teachings particularly on his life. So, drag päi päl means the glory of fame and lham mer dze päi ku means resplendent form, or that merely his appearance is very powerful and glorious. Just by his appearance he overshadows or overpowers all those who see the manifestation of his form. This power of his appearance is not external power; it is inner power. Through his inner realizations, his inner power, his appearance becomes so powerful to sentient beings that it completely releases them from their life sufferings. His power not being external means that he has no high rank, social status or external superiority. As you probably know, Lama Tsongkhapa was born in Amdo in East Tibet in a poor family. In the same way that many students came from far eastern Tibet in those days—begging for food along the way and carrying their bedding and other small things on their back on a bamboo frame—Lama Tsongkhapa himself also traveled alone to Lhasa, in central Tibet. It took him about six or seven months. Once there, he met many great masters and not only put great effort into studying all the teachings of the Buddha, but he also meditated on them, realized their profound meaning, and became so glorious that he became like the sun, completely illuminating the whole of Tibet with the light of Dharma. There are many other things like this that could be explained, but we don’t have enough time to go into them now. The fourth line of this verse tells us that because Lama Tsongkhapa is endowed with such a body, speech and mind, to see his physical manifestation, to hear his name or about his life or to listen to his teachings, and to remember him from our mind becomes beneficial, worthwhile and very fruitful for us. Of course we have to prostrate to the lamas, but first we should know the reason for doing so. If we don’t know why we are prostrating, then even if we do bow down, it won’t become particularly beneficial or be sensible to do so. When we bow down to someone, we need to know the qualities of the object of prostration to make it meaningful. Therefore, this brief explanation of Lama Tsongkhapa’s body, speech and mind are explained. The purpose of prostration is to express our respect and to accumulate merit; this is enhanced by knowing the details of the life and qualities of the object of prostration. Prostration is also an antidote to pride. I offer to you, the supreme field of merit. Yi wong means pleasing. That means the offerings should be pure, clean and good in appearance. Making an offering that doesn’t even please ourselves is not at all good for the accumulation of merit. Yi wong chhö yön actually means pleasing water offerings, but it doesn’t have to be only water. We can also offer tea, milk, yogurt or any other kind of liquid. However, in this practice it is not right to offer wine, beer, spirits and so forth because Lama Tsongkhapa was a bhikshu. Na tshog me tog means various flowers, many, many different kinds of flowers, some as individual stems, some as garlands and some as flowers for house decoration. There are many different ways to offer flowers. If we can get actual flowers we should offer them by placing them at the front of the altar, but if we can’t, we still have the right to offer all the flowers growing wild in fields and on mountains and cultivated flowers in people’s gardens and in the park. You can offer all these beautiful flowers mentally and make an immense offering of them to the lamas. The next line talks about offering incense and so forth. We should offer incense that smells good, but the fragrant incense and scented water we offer should be natural and pure, like from sandalwood and flowers, not chemical perfumes and powders or the smell of soap or anything like that. If such natural fragrances are not available we can create them in our mind. Visualize that all of space, the whole environment, is filled with the fragrance of flowers, sandalwood and so forth. Dri zhim dug pö is fragrant incense and nang säl is light. The light we offer is not only that of butter lamps, candles and so forth—whatever’s on your altar—but also the light of the sun and the moon. You can even offer the electric lights of cities and so forth. Basically, we offer whatever helps illuminate darkness. In the West, big parks, for example, are very beautiful at night, with all their light displays. All these beautiful appearances we take not for ourselves, for our own pleasure, but in order to make an offering of them to the lama. Take it mentally and, in this case, offer it to please Lama Tsongkhapa. Dri chhab is scented water. This scented water is also natural: sandalwood water, rose water, saffron water and so forth. It is not artificial perfume. If we have this kind of natural scented water we put it in a cup or bowl and offer it. Although it is meant for the body of the lama, we don’t pour it onto the pictures or statues because it might damage them. Sog means and so forth or the like. Here, sog includes the food offerings, the music offerings, and all the other offerings, such as garments etc. These are explained in detail in the offering part of the Bodhicaryavatara. In the next line, ngö sham means actually arranged, or performed, and refers to those few offerings that we have put on the altar. But we have to offer much more than that. Thus we have yi trül, which means manifested from or created by the mind, a huge collection of offerings that fills all of space. All these vast clouds (chhö trin) of offerings are like an ocean (gya tsho)—in other words, very many. The last line of this verse refers to the fact that in order to attain buddhahood we need to accumulate vast stores of merit and the best means of doing this is with our guru, our lama; here, Lama Tsongkhapa who is, in essence, our own root guru. There is nothing superior to this, therefore he is referred to as the supreme field of merit, sö nam shing chhog. For example, by sowing grape seeds in a field we obtain a great crop of grapes. Similarly, by accumulating merit in relation to the supreme field of the guru, we obtain the greatest of all results, the supreme fruit of buddhahood. In this way, the lama is also a field that yields fruit, but the fruit we obtain is the supreme fruit, the ultimate goal, therefore the lama is referred to as the supreme field, very different from an ordinary, worldly field. From the bottom of my heart, I regret and fervently confess them all individually. The first line is different in some texts, where it is dag gi thog me instead of gang zhig thog me but it means more or less the same thing. Dag gi is actually clearer than gang zhig. Gang zhig refers to the actual downfall itself whereas dag gi means “by me,” the one who actually accumulated these downfalls. There can be another difference in some texts, where it says lü ngag yi sum, which means “by the three doors of body, speech and mind,” instead of lü ngag yi kyi, which means simply “by body, speech and mind.” It can be either way; it doesn’t really matter. Thog me dü nä means from beginningless time. All the non-virtuous actions that we have accumulated in the past up to now, from time immemorial up to this moment, all that we have done in the past…this is what it means. What we have accumulated from time immemorial are so many non-virtuous actions—killing and so forth—by body. We have also accumulated countless non-virtuous actions of speech, such as lying. And by mind, we have created even more. To be very precise, we can say that almost every thought we have had has been non-virtuous. That is how much non-virtue we have accumulated through our mind. We don’t remember most of the non-virtuous actions that we have accumulated in this life, but we should at least be able to remember the gross ones, the most important ones. But while we can be fairly sure of the major negativities we have created in this life, we might have some doubt about the non-virtues that we have accumulated in our past lives. However, we can see that we have a natural tendency to accumulate non-virtuous actions—nobody has to teach us and we don’t have to make any effort to learn them. Very naturally and spontaneously we accumulate many non-virtuous actions. This inherent tendency to create non-virtuous actions in this life is the fruit of past non-virtues, a clear sign of the great acquaintance we developed with non-virtuous actions in past lives. For example, when actors or dancers they develop acquaintance with their parts and moves they become so accustomed to what they’re doing that their performances become very natural and spontaneous. They don’t have to think about what they’re doing at all. Every movement of their body, every song, comes without effort. Simultaneously, our present spontaneous tendency to create non-virtuous actions is the best proof of the existence of past lives and the accumulation of non-virtuous actions in those lives as well. The next line says, “And especially, actions opposite to the three vows.” In other words, in addition to all the non-virtuous actions that we have accumulated in general, we also have some extra ones that we have accumulated in connection with the various vows we have taken. Most of us have taken all different kinds of pratimoksha vows: upasaka/upasika, shramanera/shramanerika and bhikshu/bhikshuni vows. In addition to those, many of us have also taken tantric initiations in which we have received bodhisattva and tantric vows. Anyway, each of us should know what vows we have taken. However, more—far more—than the number of vows we have taken, are the transgressions of those vows that we have accumulated; so many that they completely pour over us like monsoon rain. If we look at our daily life very precisely—for example, if we look honestly at what we have done from this morning up to this moment—we’ll find that even in this very short period we have already accumulated many transgressions of our pratimoksha, bodhisattva and tantric vows. The final line of this verse reads, “From the bottom of my heart, I regret and fervently confess them all individually.” Nying nä means from the heart. Gyö pä drag pö means with very strong repentance. This means that simply uttering a few words while feeling nothing in our heart is not confession; this does not help us purify our non-virtuous actions. We need to confess non-virtuous actions with strong repentance from the depths of our heart. So sor shag has two different meanings: one is the confession of each negative action individually, one by one; the other is to confess again and again. So sor can be interpreted either way; however, interpreting it as again and again is deeper, more beneficial. It is not enough for us to confess our non-virtuous actions just once. We need to remember and confess them again and again. By renouncing the eight worldly dharmas. In the savior’s extensive deeds I rejoice sincerely from the depths of my heart. 5. All energy, possessions and material power are deteriorating. So, Lama Tsongkhapa appeared at a time when these five signs were flourishing. He was greatly learned and knew all the texts from India as well as their Tibetan commentaries. He had studied all Nyingma, Kagyü, Kadam and Sakya lineages and received all the practices and teachings of the different traditions. It is very beneficial to study his life. Mang thö means he had much learning and drub la tsön means he made a great effort to practice. Lama Manjushri appeared to Lama Tsongkhapa and urged him to meditate, so he went directly to meditate as soon as possible. Some people may think that because Lama Tsongkhapa was a great guru and a famous master that he was of high rank and had many luxuries and things like that, but that’s not at all how it was. He didn’t lead that kind of life. When he and his eight chief disciples left for meditation they went as hermits, without any belongings or possessions. Before they left for retreat Lama Tsongkhapa and his disciples collected everything that they had except their robes and monk’s bowls and sold them to use whatever money they got for offerings. Even so, they had very little money, just a few Tibetan tsang, which is like a few rupees. So, they made offerings by selling their possessions, then left completely for meditation. The next two lines say, “And made meaningful the perfect human rebirth by renouncing the eight worldly concerns.” Chhö gyä means eight dharmas; in other words, the eight worldly dharmas. The first of these eight worldly dharmas is yearning for the pleasure and happiness of this life only. The second is yearning for praise. When someone praises us we enjoy it very much, so we’re always craving praise from others. The third is yearning for favorable speech, words. We are always seeking for something good, something nice and sweet to hear. The fourth worldly dharma is yearning for material gain in this lifetime—food, clothing, money and so forth. The fifth worldly dharma is aversion to the suffering of this lifetime. The sixth is aversion to criticism and blame. The seventh is aversion to hearing unpleasant things, the opposite of yearning for pleasant words; a dislike of unpleasant words. And finally, the eighth worldly dharma is aversion to not getting material things. Thus you can see that in the eight worldly dharmas there are four that we always seek out and four that we always wish to be separated from. They are called worldly dharmas because they are the principles of worldly people, those who do not practice Dharma at all or who do not practice it purely, beings whose whole lives are completely spent and sacrificed for gaining the first four and abandoning the second four. We are completely deceived by these eight worldly principles. They take us away from the true practice of Dharma. Not only do they interfere with our practice of Dharma but they also cause us much trouble and suffering. All the fighting, death and other sufferings in the life of a worldly person are because of these eight worldly dharmas. From a quarrel between two or four people up to a war between great nations, all is for the purpose of the eight worldly dharmas. Although these eight worldly dharmas interfere with our practice of Dharma and cause us much trouble and suffering, if they didn’t always force us to accumulate non-virtuous actions, they might not be so bad, but the fact is that all the non-virtuous actions that we accumulate individually or in common, from childhood all the way through our entire life, are all incurred through our pursuit of the eight worldly dharmas. Therefore, these eight worldly dharmas that give us so much trouble are completely unworthy of the attachment we have for them. They are deeply wrong for us to be involved in. But out of ignorance, we worldly beings, not knowing this, get purposely, voluntarily and completely involved in them. True practitioners of Dharma totally renounce the eight worldly dharmas and practice everything that is their opposite. All the great gurus of the past, such as Jetsun Milarepa and Lama Tsongkhapa, renounced the eight worldly dharmas, fought against them with all their might and gained victory over them. Lama Tsongkhapa said, “Even from childhood I had a spontaneous tendency to be afraid whenever somebody offered me something or prepared a high seat for me, because I realized that all worldly gains are deeply impermanent.” So, chhö gyä pang pä means by renouncing the eight worldly dharmas. Däl jor dön yö je means making this perfect human rebirth meaningful and worthwhile: by renouncing the eight worldly dharmas he made the precious human life that he had obtained worthwhile and fruitful. Lama Tsongkhapa never wasted even a second of his precious life. The next two lines read, “In the savior’s extensive deeds I rejoice sincerely from the depths of my heart.” Gön po khyö kyi means you, the savior. Lab chhen dzä pa la means in the great wave of your deeds, the vast and profound deeds of Lama Tsongkhapa, I rejoice from the depths of my heart. Dag chag means I or we; sam pa thag pä means from the depths of our thought or mind; yi rang ngo means rejoice. All together, it means that we rejoice in the great, extensive deeds of Lama Tsongkhapa, not just paying lip service to them but we rejoice from the depths of our heart, from deep within our mind. Rejoicing is the supreme practice for accumulating merit. Rejoicing counteracts all delusions in general but it is the direct antidote of jealousy in particular. Jealousy toward the goodness and practice of other beings causes our merit and development to degenerate. Rejoicing in the goodness and precious deeds of other sentient beings doesn’t take much effort but accumulates vast amounts merit. In other words, they put much effort into practicing Dharma but simply by rejoicing in their practice, we can create much merit for ourselves. The next verse is a request for the turning of the wheel of the Dharma, a request for teachings. For the ears of sentient beings who are the objects to be subdued. 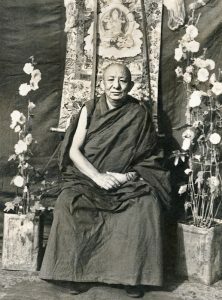 Je tsün la ma means venerable lama. I explained the meaning of that in Verse 2. Dam pa means holy, or supreme; the supreme guru. Lama Tsongkhapa has given us all the methods and prerequisites that gradually lead us to the attainment of the ultimate goal of enlightenment. Therefore, he is the supreme lama. Khye nam kyi means by you. The next line says that all of space of dharmakaya is filled with the clouds of wisdom and love. Chhö ku means dharmakaya; kha la means space. Because Lama Tsongkhapa is a buddha, his mind is in the nature of the dharmakaya; his mind resembles space, infinite space. Gathering in this space of Lama Tsongkhapa’s dharmakaya mind are clouds of wisdom and compassion, from which falls rain. Khyen means wisdom; tsei means love and bodhicitta—the method side qualities of mind. Trin thrig nä means by gathering the clouds. Ji tar tsham päi means fittingly, or whatever is suitable. We are requesting the lama to turn the wheel of Dharma, to give teachings in a way that fits, or suits, the capacity of the sentient beings. This has a deep meaning. For example, a wise doctor gives medicine to different patients according to the strength of their body. A doctor does not prescribe strong medicine for a person who is very weak because the patient’s body cannot support it; therefore the doctor prescribes a milder medicine; for patients with stronger bodies the doctor prescribes stronger remedies. Like this, in a fitting way, the doctor writes the prescription. A doctor just thinking, “I have this really strong medicine,” and then immediately prescribing it without thinking about the capacity of the patient, may do more harm than good. It is the same for patients as well. They should take the medicine that suits their body; they can’t just go out and buy the strongest medicine there is without taking into account the strength of their body. Therefore, in the same way, we request the lama to teach the Dharma according to our capacity, for the benefit of all sentient beings. If a lama gives a student of small capacity a very high and powerful practice, it might harm rather than help the student. Dül ja means disciple, the object to be subdued; dzin ma is another Tibetan word for earth, or ground—dül ja dzin ma la means on the field, or ground, of the disciples, the objects to be tamed. Zab means profound; gyä, vast, extensive; chhö kyi, of Dharma; chhar pa, rain; bab tu söl, let pour down. Thus, we are requesting the lama to let pour down the rain of profound and extensive Dharma fittingly on the ground of the disciples. As I mentioned before, generally in the seven limb puja, the request for the long life of the lama or the buddhas is the sixth of the seven limbs, so normally it would come at this point, but in this practice, because it is such an important request, it is explained at the beginning. Therefore, the next limb is that of dedication. 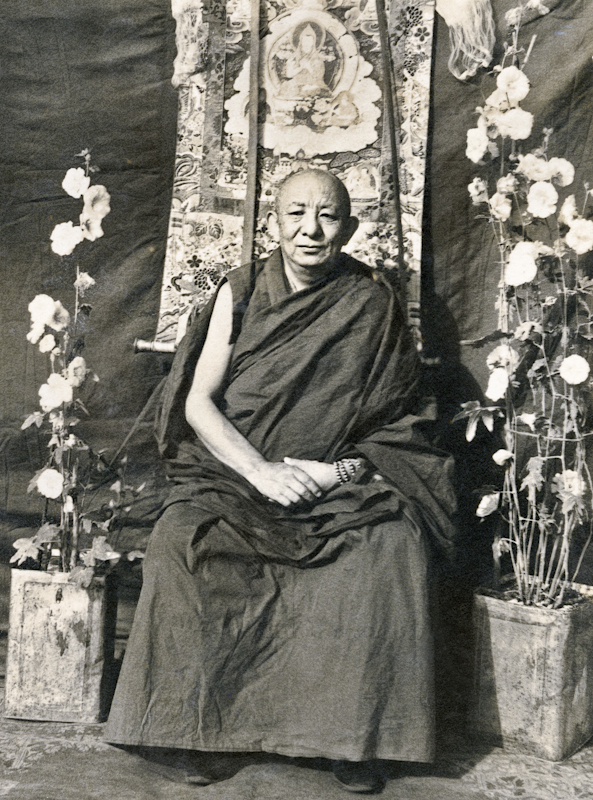 Of venerable Losang Dragpa to shine forever. We dedicate all the merits that we have accumulated since beginningless time up to now for two great purposes. One is for the benefit for the doctrine, the teaching; for the flourishing and stability of the Dharma. The other great purpose is for the benefit of all sentient beings. Then, in particular, since this is a guru yoga practice in connection with Lama Tsongkhapa, we dedicate all our merit for the flourishing and stability of Lama Tsongkhapa’s teachings, the essence of which is the three principal aspects of the path: renunciation, bodhicitta, and the realization of shunyata. The essence of the teaching of Lama Tsongkhapa is these three principles of the path and the practice of tantra as well. We dedicate our merit for all that to flourish forever. Actually, there isn’t any separate, independent doctrine or tradition of Lama Tsongkhapa. In reality, the tradition of Lama Tsongkhapa is the Kadam tradition, which was founded by Lama Atisha. But then we have this term “Gelug,” which makes it even worse. It is not only pronounced incorrectly but it’s also spelt wrong. It should be Ga, not Ge, because Lama Tsongkhapa founded the first monastery, the great monastery on the mountain, Gadän Monastery. Once Lama Tsongkhapa’s tradition became established, people started calling it the Gadän lug, Galug for short; lug means tradition. So, Galug means tradition of Gadän. Now that we have invited Lama Tsongkhapa from the heart of Buddha Maitreya, requested him to remain in front of us as a field of merit and to this field of merit have made all the offerings, including the seven-limb puja, from prostration to dedication, we offer a mandala. After the mandala offering comes the recitation of the lama mantra and the practice for accomplishing the three attributes of the Buddha in general and the wisdom attribute in particular. There are many different kinds of wisdom. First we need great wisdom. But it is not enough simply to have great wisdom; we also need illuminating wisdom, a wisdom that is very clear. But neither are great wisdom and clear wisdom enough; we also need quick wisdom; wisdom that is very fast without taking time. Neither is it enough to have great, clear and quick wisdom; we also need profound wisdom, which can dig deeply into our practice. Superficial wisdom is not of much benefit or use; it understands and realizes only that which is on the surface. It cannot plumb the depths. Combine into one and absorb into the crown of my head. This verse means that through our having made the offering of practice and a mandala to Lama Tsongkhapa and by the force of our request made with strong devotion to Lama Tsongkhapa and his two main disciples, three hollow white beams of light, like tubes, emanate from their hearts, combine into one, enter the crown of our head and absorb into us. Bug chän means hollow, like a tube; chig tu dre nä means combined into one; rang gi chi wor zug means absorb into the crown of my head. Three light rays emanate from the heart of Lama Tsongkhapa and his two chief disciples. The central one comes from Lama Tsongkhapa, one from Gyältsab Rinpoche (to Lama Tsongkhapa’s right) and the other from Khädrub Rinpoche (to his left). You should remember this very precisely because in meditation you have to visualize all the details. The light rays that emanate from their hearts are radiant white in color. They are beams of light but hollow inside, like a tube; empty inside. One starts from the heart of each of the three lamas, but after a short distance they combine into one. The end of this single beam that is a combination of all three absorbs into the crown of your head. Radiant white nectar the color of milk. Are washed away and my body becomes as pure and clear as crystal. Radiant white nectar, amrita, flows through the hollow tube of light that has emanated from the hearts of the three lamas. This ambrosia is much more radiant than milk and absolutely white in color. Although in appearance it is like a liquid, it is in nature the buddha mind. It starts flowing down the three tubes of light, which then combine into one—like three rivers that come from three different valleys and unite into one, which then becomes much more powerful—enters our head and flows down into our body. When the amrita, whose nature is that of the buddha mind, comes into our body it completely washes away all interferences, illnesses—physical and mental—evil influences, downfalls, karmic obstacles, obstacles due to delusion and imprints; all gross, medium and subtle interferences are completely washed away. Our body is completely rid of them, as it says in the last line of this verse, and our whole body becomes full of light and amrita and extremely radiant, like a light body, like light fills a bulb. Like that, our body becomes completely full of light and amrita, with no external or internal impurities left in it. But this light and amrita are not simply like ordinary water or some other liquid like that—in this light and amrita are tiny letters, tiny versions of the lama mantra, the syllables of the mantra and many different things mixed with and absorbed in it, which I will explain in detail. If we practice this guru yoga purification very strongly it becomes exactly the same as practicing Vajrasattva meditation. The effect is exactly the same, sufficient for Vajrasattva purification. But when practicing this meditation—the light and amrita flowing down, entering us and purifying all our obstacles and filling our whole body—we should not do the visualization quickly but slowly, stage by stage. During this time, we recite the lama mantra, this one-verse praise that is the lama mantra of Lama Tsongkhapa. We recite it again and again, all the while visualizing in our mind the entire process of purification. Therefore, if we practice this lama mantra, called the migtsema, correctly, with the right motivation and the proper visualization, it also fulfills many other practices, because it contains within it the profound meaning of many aspects of Dharma; many things are concentrated in these few words. So, to summarize, we have reached the point of complete inner purification by the white light and nectar that emanates from the three hearts of the three lamas, which are combined into one. This light and nectar absorbs into the crown of our head and enters our body, purifying all our obstacles, external and internal. Our body is filled with light and amrita, then it becomes radiant and completely pure, inside and outside. At the end of the purification, our body becomes completely in the nature of light, like a light bulb which changes completely from the outside. Our body is completely filled with amrita and light, and within this there are many syllables of the lama mantra. Those who can read Tibetan should visualize the syllables of the lama mantra, which are not as they are written, but are more in the nature of light. They are like light letters. When we say that our body is filled with syllables of the lama mantra, it is not like a bag filled with grain; rather, the syllables fill our body like rain in a fog. With this visualization in our mind, recite at least one mala of the lama mantra. During this one mala, visualize this process of purification, with light coming down from the chests of the lamas, entering our body, purifying the obstacles and filling it with light and amrita, and the lama mantra syllables. Avalokiteshvara who is great treasure of compassion without apprehension. Chän-rä-zig is Avalokiteshvara. Mig-me means without apprehension, without grasping. This refers to shunyata nature, which is without inherent nature, or void of inherent nature. This shunyata nature is called mig-me. Mig means apprehend and me means without. Mig-me means no true inherent nature to apprehend. Compassion without apprehension means compassion which is accompanied or supported by the wisdom realizing shunyata. Compassion which is supported by the realization of shunyata is much greater, more profound and powerful than ordinary compassion without the support of wisdom. Tze-wäi is compassion and ter-ch’en means great treasure. The great treasure of this compassion which is supported by the wisdom of all the buddhas is Avalokiteshvara. When the compassion of every buddha appears in the form of a deity, it is none other than Avalokiteshvara. In this prayer we are saying, “Lama Tsongkhapa, you are in the nature of Avalokiteshvara who is the great treasure of the compassion of all the buddhas.” Many scriptural sources and reasons have proven completely that Lama Tsongkhapa is the manifestation of Avalokiteshvara, but there is no need to explain this in detail now. Therefore, this practice of guru yoga will be sufficient for a person who wishes to develop compassion through the practice of Avalokiteshvara meditation. Dri-me is without defilement or impurity. Ky’en-pä is wisdom or comprehension, cognition. Dri-me is realizing everything in a pure sense without any mistake or wrong view. The wisdom of every buddha, without defilement or illusion, is the very nature of Manjushri. In other words, Manjushri is the very form of all the wisdom of every buddha. This means, “Lama Tsongkhapa, you are also the very Manjushri who is the lord of wisdom without defilement, the wisdom of every buddha.” As I explained in the beginning, although Lama Tsongkhapa appeared in human form as a spiritual master, in his ultimate nature he is Manjushri. Vajrapani who destroys the force of mara without exception. In short, Lama Tsongkhapa is the combined form of all three deities; Avalokiteshvara, Manjushri and Vajrapani. In other words, Lama Tsongkhapa is the concentrated form of all three attributes of Buddha: compassion, wisdom and power. There are people who wish to practice meditation in connection with Avalokiteshvara, Manjushri and Vajrapani and there are those who wish to develop compassion, wisdom and power. If we practice this guru yoga seriously, it will be sufficient. Through this guru yoga, we can accomplish all our goals together. Although there were countless masters in Tibet, when Lama Tsongkhapa appeared in the Land of Snows he became the crown of all the sages or masters in Tibet. Lo-zang drag-päi is Lama Tsongkhapa’s personal name. What are we requesting? We are requesting Lama Tsongkhapa to bestow upon us the blessing of the three attributes of Buddha, so that we will receive these three attributes within ourselves; so we will generate, grow and accomplish these three within ourselves. With this meaning in our mind and with the visualization as explained before, we practice the recitation of the lama prayer. Thus, first we purify all the obstacles and interferences that are within us. After the purification, when all these obstacles and interferences are purified, we must begin the actual practice for the development of wisdom. There are three stages of wisdom. First, we must develop great wisdom. Previously there was radiant white light emanating from the chests of the three lamas, combining into one and absorbing into the crown of our head and purifying us. Now this light suddenly changes color. For the development of great wisdom, the color of the light suddenly changes into yellow. It is not absolutely yellow; it is more like orange. Actually, the amrita flowing in the light tube is this color, so by changing the color of the amrita, it also changes the color of the tube, the light itself. So, everything turns a light orange color. Again the great wisdom comes in the form of orange amrita that fills our body. This means the great wisdom of all the buddhas is transformed into orange-colored amrita which emanates from the chest of Lama Tsongkhapa, comes down through our head and fills our body. If a bottle is filled with orange liquid, from outside and inside the color is completely changed to orange. In the same way, our body is filled with orange amrita. This is not exactly like filling a bottle with an orange water, because it is not only amrita liquid but also, as explained before, it is radiant, orange light. So from outside and inside we become completely in the form of orange light. The atoms of amrita appear in the form of Manjushri. Here we visualize that the atoms of amrita are in the form of small Manjushris, so our body contains countless small forms of Manjushri. From these Manjushris in our body, light emanates and goes out in all ten directions. This invites and brings back to us the great wisdom of all the buddhas in the form of countless Manjushris in all sizes. They absorb into us through all parts of our body, like rain on a lake. It’s as if all the raindrops are completely absorbed into the lake. We must meditate strongly that we have received the power of the great wisdom of every buddha within us. Light emanates and goes out to the ten directions. The great wisdom of the Victorious Ones and their sons comes in the form of the deity and fills our body. With this visualization, the orange-colored amrita and light comes down from the chests of the lamas, then enters and fills our body. All the atoms of that amrita are in the form of countless Manjushris. From these Manjushris, light emanates and goes in the ten directions, inviting the great wisdom of every buddha in the form of countless, different-sized Manjushris. These completely absorb into us, thus we receive the power of the great wisdom of every buddha within us. With this visualization and meditation we make one mala of recitation of the lama mantra. The next stage is the development of the clear wisdom of every buddha. For the development of clear wisdom, again we visualize the lama with light emanating from his chest and absorbing into us. It is the same colored flow of amrita as previously, but instead of the form of Lama Manjushri in the amrita, it is now the Manjushri mantra. All the atoms of the amrita are not in the form of the body of Manjushri; instead they are in the form of the mantra of Manjushri, OM AH RA PA TSA NA. So, all the atoms of the amrita are in the form of the mantra syllables, which are of very strong radiance. The light of even one syllable can completely illuminate the whole universe, it is so powerful. They are luminous syllables. Because this is for the development of clear wisdom, we should also visualize as clearly as possible that all the lights and everything else are radiant, clear and luminous. These syllables, as I explained before, are not like painted, drawn or written letters. They are all in the form of light letters, absolutely luminous. The light of all the mantra syllables emanates to the ten directions and the clear wisdom of all the buddhas is invited in the form of the letters OM AH RA PA TSA NA in countless numbers, and these absorb in us. So with meditation we recite the lama prayer again with another mala. That is the meaning of the following verse, which we recite before the second mala of the lama mantra. This is the same prayer as the previous one for great wisdom, but there have been just a few changes. In the first line, it is now säl-wäi ky’en-rab, which means clear wisdom. The second line is exactly the same. In the third line, instead of Manjushri’s body, it is a-ra-pa-tza-näi. The fourth line is the same. Again the fifth line is changed to säl-wäi ky’en-rab, which means clear wisdom. The second line is exactly the same. In the third line, instead of Manjushri’s body, it is a-ra-pa-tza-näi. The fourth line is the same. Again in the fifth line, change to säl-wäi ky’en-rab, clear wisdom. In the last line, there is now zung-ngag, which means in the form of mantra. Having rejoiced in this verse, begin the lama mantra again and recite another mala, doing the visualization that has already been explained. When you have finished one mala of the lama mantra for the development of clear wisdom, then go to the next stage. Again, this is the same verse with a few little changes. Now it is nyur-wäi ky’en-rab which means quick wisdom. The next change is to DHI-yig mar-ser gy’i which means the orange syllable DHI. Again, line five is changed to nyur-wäi ky’en-rab, the quick wisdom of the Victorious Ones and their sons. In the last line, sa-b’ön nam-par means in the form of the seed. After you have finished one mala for the development of clear wisdom, stop and recite this verse; then with this visualization, recite one mala of the lama mantra for the development of quick wisdom. Still another wisdom is left—profound wisdom. For the development of this wisdom, the visualization is basically the same except the atoms of amrita are in the form of the sword and the scripture—the symbols in Manjushri’s hands. You don’t have to feel any discomfort from visualizing many swords in your body, because all these swords and scriptures are in the nature of light. As before, light emanates from the swords and scriptures and goes into the ten directions, inviting the profound wisdom of every buddha in the same form. A countless number of swords and scriptures absorbs into us; thus we receive the power of the profound wisdom of every buddha in the same form within us. We receive the blessing of the profound wisdom of every buddha, so that our wisdom can penetrate to the very depth of every object of analysis. With this visualization we practice the lama mantra and another mala, after reciting the following verse. So, if we practice one mala for each, this makes five malas altogether. The first mala is for purification, then there is one mala for each of the four developments of wisdom. If we can practice more than that—hundreds of thousands and ten-thousands or hundred-thousands, it is even better. The first change is to zab-päi ky’en-rab, which is profound wisdom. The next change, in line three, is to leg-b’am ral-dr’i-yi, which means scripture and sword. All the atoms of amrita are in the form of scriptures and swords. Again, line five changes to zab-päi ky’en-rab. Finally, line six starts with ch’ag-tsän which means the hand symbols. With this visualization, we recite one mala of the lama prayer. Remain on my head on the lotus and the moon disk. I request you to grant me the siddhi of body, speech, and mind. We are requesting the lama to come down on our head, to remain on our head and bestow upon us the blessing of all the qualities of the body, speech and mind of the Buddha. In our visualization, first Gyältsab Rinpoche, who is on Lama Tsongkhapa’s right side, absorbs into him, then Khädrub Rinpoche, who is on his left side, also absorbs into him. From the bottom of the seat of the throne, gradually the golden throne is absorbed to Lama Tsongkhapa, then he comes down and remains on our head, facing the same direction as we are. At that time, Lama Tsongkhapa’s body must be visualized as so radiant and so beautiful on our head. We must visualize that Lama Tsongkhapa has completely accepted and promised to give us all the powers. Remain on the lotus in my heart. We are requesting Lama Tsongkhapa to come down and remain in our heart always, steadily, until we reach buddhahood. So, Lama Tsongkhapa becomes smaller and smaller until he is the size of our thumb. When he is about that size, he enters through the crown of our head and slowly comes down to the lotus at the center of our heart and remains there. There are much more elaborate forms of visualization but all these are not necessary at this time. This guru yoga and visualization can be so much more detailed, with many more things to visualize, but at the present time this might be too much. At this time, I am giving you a simple meditation especially for the development of the four wisdoms. This refers to Lama Tsongkhapa who is the lama or spiritual master, and Buddha. He is both lama and Buddha in one. Through this practice we also accomplish this state of the Lama-Buddha, therefore this meditation is called guru yoga or Lama Näljor, or sometimes La Drub, which means to accomplish the lama. May I lead them to that state. After we have accomplished the state of Lama-Buddha, then our task is to liberate all sentient beings from suffering and establish them in the state of buddhahood. That is the conclusion of the guru yoga. For those who especially want to practice seriously, if in the practice there are any questions, difficulties or doubts in the practice, or anything that is unclear, then you can come to me and I will solve the problem. A commentary given in Dharamsala, India in July 1976 on a practice to help invoke the blessings of one's personal teachers and to develop guru devotion. 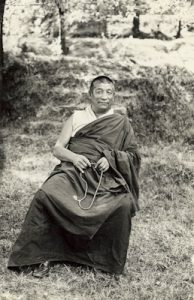 His Holiness Serkong Tsenshab Rinpoche gave this teaching in Dharamsala, July 1976, as personal advice to Nicholas Ribush, who was preparing to undertake a short guru-yoga retreat. It was kindly translated by Losang Gyältsän. Edited by Dr. Nicholas Ribush, who also received Lama Zopa Rinpoche’s kind additional advice in 1976, as given in the notes. See also the extensive commentary on Lama Tsongkhapa Guru Yoga by Lama Zopa Rinpoche on LamaYeshe.com. First there is the invocation of Je Tsongkhapa, who comes from the pure land of Tushita (Ganden). Do the usual preliminary practices as in Jor-chö, according to lam-rim, cultivating bodhicitta [see below and the note at the end]. Tushita is a pure land that is made out of lapis lazuli and precious gems from the surface of the earth. The trees and so forth are made of precious substances. The sand is made of gold and when tasted is as sweet as sugar. There are many beautiful streams. In this space…just as in Dharamsala we have the palace of His Holiness the Dalai Lama, here there is the palace of Maitreya. In front of this is a large area for the giving of discourses. And just as in Dharamsala there are the abodes of Kyabje Ling Rinpoche and Kyabje Trijang Rinpoche, here there are the houses of other gurus such as Je Tsongkhapa, Atisha, and Marpa Lotsawa. Also there are other lamas about, meditating or debating with each other. From a knot of eternity at the heart of Maitreya Buddha, a shaft of light emanates and down it, seated upon a cloud resembling a cluster of thick, freshly-made, snow-white curd, descend Je Tsongkhapa and his two disciples. They come to rest in the space just before your eyes at a distance of an arm-span, seated upon thrones supported by lions, on lotus, sun and moon. The realm from which they descend—Ganden Lha Gyä—is the realm of numberless gods. (Lha Gyä literally means “one hundred gods,” but the actual meaning implied is “numberless gods”). The je-tsun lama smiles with delight. Since you have invoked all three into the space in front of you, you have to offer the seven limb prayer. The first of the seven branches is usually prostration, but here, as a sign of auspiciousness, you make a request for the guru’s longevity, praying that he will not die soon. Doing this first has great meaning. Also, requesting your guru to live long is the best prayer for your own longevity. While you recite the words of this verse, offer a short mandala—a physical mandala with only seven heaps on the base plate: Mt. Meru, the four continents, sun and moon. This transforms into a diamond throne [a throne with a double vajra] and when you offer it, it absorbs into the throne upon which Lama Tsongkhapa is seated. Out of the guru’s holy body, speech and mind, we usually offer praise to the guru’s holy body first, but here, Lama Je Tsongkhapa is first praised for his omniscient mind, the holy mind that knows all phenomena. His omniscient mind is praised first because Lama Tsongkhapa is the emanation of Manjushri. Then we praise his holy speech—the ear-ornament of the fortunate ones—and his holy body—resplendent, radiant with the glory of fame. While praying in this way, visualize that your body transforms into innumerable forms, all of which prostrate simultaneously. If you prostrate in this way you will create great merit. These are arranged on your altar and also visualized. It is easy to do—you know how. Also offer a long mandala. We do this for purification. All the negative actions committed in your past lives and this, especially those that contravene the three types of vows—pratimoksha, bodhicitta and tantric vows—should be repented. You should repent all negative actions very strongly, feeling the regret that you would had you taken poison. Say the verse slowly, recite a long mandala and build it up physically. Why make all these physical mandalas? Because it helps your visualization. For example, when visualizing “now it becomes empty,” it is very important to have the physical object there to visualize its becoming empty; or when making inner offerings, you need a physical kapala [skull cup] or else you can’t purify it as you have to. Thus the physical mandala is to ensure proper visualization. Also, if you use grain in your physical mandala it is more beneficial if it contains some precious substances. Just as worldly people live in expensive places, if we offer valuable things to the guru it creates more merit. Anyway, we need at least some basic thing for the purposes of visualization, something on which we can visualize. Just as a rabbit’s horn doesn’t exist and therefore we can’t say it transforms into non-existence, for similar reasons we need a physical mandala as the basis for this practice. When wealthy Tibetans offered mandalas of deities on the ground they would use precious materials such as ground coral for the parts that required red-colored material, lapis lazuli for the blue and so forth. But of course, the type of material offered depends on one’s means. When you offer chö-yön (water for mouth), for instance, you can offer it in any kind of container—tin, silver, gold—without its affecting the value of the water itself, but while using a more valuable container does not improve the quality of the water, it increases the amount of merit you create. Mandala is a Sanskrit word; the Tibetan is khyil-khor, which means, literally, circling the center. In a market, the best things are at the center; that’s where the crowds of people go—to that market in the center of town, to get the best things. So mandala means “taking the essence”—nying-po len-pa. Then, at the center of the market, you’ll find the best store; most people congregate around that shop, to take the essence of that shop. Applying this to tantra—the very essence is the non-dual wisdom of bliss and void. As that is what you have to take, mandala means to take that essence for yourself. If possible, also think about the emptiness of the mandala, from beginning to end. If that is not possible, think of its emptiness at least once. There are different kinds of mandala: outer, inner and secret. The outer is the usual physical one; the inner is the transformation of the parts of the body—skin, blood and so forth; the secret is the offering of the goddesses. Then there’s also the kho-ra nyid-gyi mandala, the mandala of voidness: the mandala is merely imputed and devoid of inherent self-existence. This is the best kind. By renouncing the eight worldly concerns. We rejoice in the virtues of others. You should try to rejoice at others’ virtues without feeling any envy or jealousy. Je Rinpoche described five kinds of beings in whose virtuous actions we should rejoice: buddhas, bodhisattvas, the followers of the Shravakayana and Pratyekabuddhayana, arhats of the Shravakayana and Pratyekabuddhayana, and ordinary people. Again, say the verse slowly, recite a long mandala and build it up physically. We request the guru to turn the wheel of Dharma, that is, to give discourses. Here, offer the nine-heap mandala: one central heap, four heaps in the each of the cardinal directions and four in each of the intermediate directions. This symbolizes the one-thousand-spoked wheel—the central heap is the hub, the others form the eight spokes of the Dharmachakra, and this is transformed into a one-thousand-spoked wheel and offered into the hand of Lama Je Tsongkhapa, requesting him to turn the wheel of Dharma. There are various types of dedication, for example, that of the body, that for dissemination of the doctrine, that for the continued meeting with spiritual teachers in all future lifetimes and that for receiving enlightenment in this very lifetime. In order to be able to dedicate you must first create merit through performing virtuous actions. When you direct your thoughts to such goals without specific merit being dedicated, that is prayer. Here, since you have created merit through performing the first six branches, you dedicate it. You don’t have to say the words of the mandala prayer. Just visualize that the physical mandala is made up of your past, present and future virtues. For example, if you have a piece of gold, you can make it into many different things, such as offering bowls or other religious items, and offer them to your lama, asking him to please accept them in order to spread the Dharma. In this way, then, you offer your merits to Lama Je Tsongkhapa, for the dissemination of his Doctrine throughout the ten directions. This is a very elaborate seven limb puja. Each branch has four lines, whereas usually there is just one. There is no better practice for purification and the accumulation of a great store of merit than the seven limb puja, and there is no substitute for this practice. Great bodhisattvas on all ten levels do this practice and even they know nothing better than the seven limb puja for purification and the accumulation of merit. Actually, your preparations should contain all six preliminary practices. a) First sprinkle water on the floor —the dust of delusion is suppressed by the cultivation of bodhicitta, i.e. the delusions that veil your mind are now suppressed. b) Hold the broom—the right understanding of emptiness—and sweep the dirt to the corner. c) When all the dirt has been collected together transform it into ambrosia by blessing it with the mantra OM AH HUNG. d) When you throw it outside think that the Lord of Death, who is always lurking in wait to take your life, receives this dirt-transformed-into-ambrosia as you throw it into his mouth. Completely satisfied, he disappears under the earth. Doing this daily is the best practice for longevity. Since you have to clean your house daily you should do it as above. In that way, just by sweeping your room you can create inconceivable merit. So you should be very careful from the very beginning of the day. a) Your mind becomes very clean and active, as the atmosphere is good. b) It helps others also to have an active mind, as they see your neat and tidy room. c) It creates special karma to have a very beautiful form in future lives. d) Those great nagas and gods who are fond of virtuous things are also happy when they see your neat and tidy room. For example, recall what happened when Ashvagosha was debating with Arya Deva: Ashvagosha had accomplished Mahadeva (Shiva), who promised to come and help when Ashvagosha was almost defeated, but Arya Deva took a stone from his shoe and tied it to the top of Ashvagosha’s umbrella. Thus, because it was dirty, Mahadeva did not come as Ashvagosha expected. e) Most important: in future, when you are enlightened, it creates special karma to actualize the abode—your own Buddha field. On the other hand, sweeping (wiping or rubbing) symbolizes the uninterrupted path—that is contemplation, or the meditation part of the path in the process of fighting delusion—and the liberated path, when you are liberated from delusions of that path. It creates the karma to achieve those two—the meditation period and the post-meditation period. If you have seven bowls, offer them. If you have only one bowl, offer that alone. If you have no offering bowls you can use ordinary cups. Also offer some incense. a) Arranging your altar. You can put reliquary objects, images of your gurus, buddhas and bodhisattvas and so forth. But do not put gold stupas up high and clay ones down low, for example; you should not discriminate between holy objects in such a material way. When you sleep, do not point your outstretched legs towards any reliquary objects. Arranging your altar also means covering thangkas at night and uncovering them in the morning. If you do not do this, at least you should look at them properly. It is said that beholding an image of the Buddha creates more merit than beholding the Buddha himself. i) Dishonesty of material. The things you offer should be free of the five wrong livelihoods: flattery, hinting, giving in order to receive (bribery, where you give something small to get something big), exerting pressure on others (coercion) and being on one’s best behavior (hypocrisy). Such offerings are not fit to be given. ii) Dishonesty of motivation, that is, motivation influenced by the eight worldly dharmas. For example, if somebody is coming to visit, you make a magnificent offering so that they’ll praise you. If you are offering food, the food that you offer should not be worse than that which you eat. And most important, when making ritual cakes (torma) and so forth, you should wash your hands and face, clean your nails and offer them properly. Once you have cleaned your offering bowls you shouldn’t put your fingers in them. Before you arrange your altar, purify the area around it with incense. Your bowls should be set evenly, in a straight line, the correct distance apart. If you do not have offering bowls, you can use a properly cleaned cup. If you need to drink from it, you can take it back, use it, clean it properly and then put it back on your altar. So all this is preparation, but you make the offerings with the appropriate verse of the seven limb puja. Generate bodhicitta motivation, wishing to attain enlightenment for all sentient beings. Then sit in the seven-point posture of Vairochana and watch the motivation. If the motivation is not correct, then correct it. If delusions are strong in the mind, to suppress them you can watch the breath. If this is done it makes eight aspects of the posture. If the delusions are not strong, it becomes the seven-point posture of Vairochana. Transformation of the surface into lapis lazuli was done when cleaning the room. In the space in front of you is a throne supported by snow lions. On it is seated Guru Shakyamuni Buddha, the quintessence of all refuges. The size is according to your wish: a cubit in height or four finger’s height; whatever. Regard him as the quintessence of all refuges. This visualization is according to Kunsu Norpulu. All enemies; on the right side are your father and all male sentient beings; on the left side are your mother and all female sentient beings; and behind you, servants and others. This includes all sentient beings from all the six realms. They appear in the form of humans, as many as the dust of the earth, and you lead them in the chanting of refuge. i. Fear: if we are afraid, we think about protection. That is why fear serves as a cause. ii. Conviction: Though some people take refuge in worldly gods and demons, as the worldly gods and demons are not free from fears, they do not have the power to help us. If one is not free from all sufferings, one cannot help all others become free. Also, even if free, one should have the skill of helping other sentient beings. Although pratyekabuddha arhats are free from fears and sufferings, they do not have this skill. But Buddha has all four qualities. He benefits all sentient beings, irrespective of who benefits him and who does not. He also has equal immeasurable compassion, without feeling close to relatives and distant from enemies, for example, he has equal compassion for Devadatta, his rival and Rahula, his son. What is the real taking refuge? The real refuge is having the mind that fully relies on Buddha, totally. Whatever happens, we rely on the Triple Gem and follow the teachings. According to Vaibhashika, we say, “I take refuge in Buddha.” The words are about refuge, but in the Mahayana path, the real refuge is the mind that relies fully on Buddha, so saying the words is only part of it. If there is the danger of a thief entering your room, you can only rely on someone you know is really dependable. If you are sure that you can rely on someone fully, you appoint him as the guard and give him the key to your treasure. By knowing that Buddha is the one you can rely upon fully, that mind is taking refuge. a) Wishing bodhicitta - wishing to attain enlightenment for the sake of all sentient beings. Try to think that Guru Shakyamuni Buddha is very pleased and is in a gay mood. But especially now, he is more pleased, and a second guru comes from the first one and dissolves into you. Thus you are transformed into the real Guru Shakyamuni Buddha, as are all the sentient beings who surround you. This means taking the result as the path. Bodhicitta with result is taken as the path. This is very important. So after this, to enhance your bodhicitta, recite the four immeasurables. For example, if one sentient being has a headache, thinking that all sentient beings should be separated from headaches creates immeasurable merit. So, cultivating the feeling that all sentient beings should be separated from all suffering is really inconceivable. So taking refuge is to differentiate you from the traveler of the wrong path. The cultivation of bodhicitta distinguishes you from the traveler of the lower vehicle, the Hinayana path. As the latter is only concerned with attaining liberation for himself, and your path is concerned for all sentient beings, the distinction is vast. b) Elevate the visualized Guru Shakyamuni Buddha higher in the space before you, and after you have invoked Lama Je Tsongkhapa, the former comes down and dissolves into Je Tsongkhapa. Thus the third preliminary practice is sitting in the Vairochana position, taking refuge and generating bodhicitta. This involves the invocation of Je Tsongkhapa from Maitreya’s heart, as before. This is done by the seven limb practice. (The offerings were consecrated before—here they are offered during the second branch). This is the recitation of the migtsema prayer. This ends the explanation of the six preliminary practices, Jor-chö. There are physical offerings on your altar; you should mentally transform these and visualize magnificent offerings filling all space. If you know how to make mental offerings correctly you will never suffer from a lack of materials to offer, since you can offer, for example, the rays of the sun and moon as light, and so forth. Therefore, visualize that all of space is filled by the offerings you make. The mandala of offering is made at the offering verse of the seven limb practice. When you say, Idam guru ratna…, close your mandala base and start the other four lines. The mandala of request is made after the seven limb practice has finished, that is, after the dedication verse. Then say the prayer, “Requesting the objects of refuge for the three great purposes” (pacification of all wrong conceptions, generation of all right realizations and pacification of all outer and inner obstacles). Do the prayers for purifying the place (Tham chä di ni sa zhi dag) and offering (Lha dang mi yi chhö päi dzä). First transform yourself into Samantabhadra, holding a precious gem between your hands, as does Avalokiteshvara. From the gem, immeasurable rays go out carrying offerings of argham, padyam and so forth. Then, from each of these rays a second Samantabhadra is emitted, and from each of these a third, and so on, ad infinitum. (In the back of space, a knot of eternity symbolizes these offerings.) (?) Now all those Samantabhadras that have been emitted have to be dissolved back into the original, without any mistake. This is a very difficult practice for us to do. This method of emitting them is found in Tara rituals. Then say the offering mantra (OM NAMO BHAGAVATE…) three times and the power of truth prayer (Kon chog sum gyi den pa dang…). Visualize that all the offerings arranged on your altar transform into immeasurable offerings filling all space. In this pure land, many flowers and trees sprout out freshly, like the mushrooms that spring up after rainfall. These, too, can be offered. Invoke Lama Tsongkhapa and his two disciples into the space in front of you. Actually, there are many ways of visualizing this—here it is brief, but remember that these three are the quintessence of all refuge. The distance between you and the lamas is an arm span. They are at eye-level, seated upon throne, lotus and moon disc, and wearing the three robes of a monk. Je Rinpoche is in the mudra of giving Dharma. Gyältsab Rinpoche is to the right of Je Rinpoche. His right hand is in the mudra of giving Dharma and he holds a scripture in his left hand. He appears slightly elderly and is tilted towards Je Tsongkhapa. Khädrub Rinpoche is to the left of Je Rinpoche. His right hand is in the mudra of giving Dharma, and he also holds a scripture in his left. His appearance is more youthful (he died at only 58 years) and he is also tilted towards Je Tsongkhapa. Je Rinpoche is also of youthful appearance and is rejoicing—in a happy mood and smiling at you. Now do the first of the seven limbs—requesting the guru to live long, for hundreds of eons, for the dissemination of the doctrine. Before the offering verse (verse 4), offer the long mandala, the mandala of offering. While saying verses 5 & 6 slowly (confession and rejoicing), make another mandala offering. With verse 7 (requesting to teach), offer the nine-heap mandala, transformed as explained. With verse 8 (dedication), make a long mandala offering (physically), visualizing the offerings in the form of a mandala. After the seven limbed prayer has been completed, again offer long mandala of requesting. I am requesting you please to immediately pacify all wrong conceptions, from incorrect devotion to the guru up to the subtle dual view of the white, red and dark visions that exist in my mind and in the minds of all mother sentient beings. I am requesting you please to immediately generate all the right realizations from guru devotion up to enlightenment in my mind and in the minds of all mother sentient beings. When we recite this prayer we make requests by seeing external and internal resemblance and inseparability. The emanation of the compassion of all the buddhas is Avalokiteshvara and you, Je Tsongkhapa, resemble Avalokiteshvara. The emanation of the wisdom of all the buddhas is Manjushri and you, Je Tsongkhapa, resemble Manjushri. The emanation of the power of all the buddhas is Vajrapani and you, Je Tsongkhapa, resemble Vajrapani. Not only do you resemble them physically but internally, you also possess their qualities. Avalokiteshvara has infinite compassion and you not only resemble Avalokiteshvara but you also possess his qualities. Manjushri has omniscient wisdom and you not only resemble Manjushri but you also possess his great qualities. Vajrapani has great power and you not only resemble Vajrapani but you also possess his internal qualities; you have the same mind—insight, realizations—as Vajrapani. Naturally, you are inseparable from these three secret deities: you not only resemble Avalokiteshvara, Manjushri and Vajrapani, and you not only have the same knowledge that they have, but you are Avalokiteshvara; you are Manjushri; you are Vajrapani. So, make these requests knowing that he is inseparable from these three. “Secret” means that just as a spy keeps secret and will not disclose (his identity) at any cost, although Je Tsongkhapa tried not to disclose, still we know his secret, that he is Buddha, i.e. that he is these three deities. Je Tsongkhapa, or any of your gurus, have come in ordinary form, keeping their true identity secret—though they are Buddha, they hide their real form and appear in ordinary form. Think, “Now I really understand your real form”. Then visualize as you do with the Vajrasattva visualization that you are surrounded by innumerable sentient beings and immeasurable rays emanate from the heart, throat and crown of Je Tsongkhapa and his two disciples. The rays touch you and all other sentient beings, and all defilements are purified, especially the defilements of the body. Vajrasattva-type visualization. This is the same as in the refuge section. Negativities leave through the body’s openings, by overflowing and by being eliminated “on the spot”. For example, for one mala think that bodily defilements are cleansed, then speech, then mind, then all three together. See above with refuge visualization. This also purifies all other sentient beings. (a) Then Manjushri comes from the crown of Je Tsongkhapa and dissolves into your body, entering through the crown of your head—all defilements of the body are eliminated and you should feel inseparable from Manjushri. 1. Great wisdom (or intelligence). You can understand the meaning of a scripture merely by looking at it; you don’t have to rely on others to explain it to you. 2. Clear wisdom. Not only can you understand the meaning of scriptures without relying on others, but you can also discriminate between the word and the meaning without any confusion. 3. Quick wisdom. This is the wisdom that dispels doubt the instant it arises in the mind. 4. Profound wisdom. If you see a word that seems to have no meaning at all, you can go into it deeply and it becomes very profound—limitless from many points of view. When you invoke Manjushri and he dissolves into you, you receive these four wisdoms and the wisdom knowing the ultimate as well. 1. Innumerable Manjushris emanate and dissolve into you all over your body, like falling rain, bringing the great wisdom. 2. Then the OM AH RA PA TSA NA mantra, the thirty-four consonants and sixteen vowels of the Sanskrit alphabet, all Manjushri mantras and all the scriptures of the Kangyur and Tengyur emanate from Manjushri’s throat and dissolve into your throat, bringing clear wisdom. 3. Then many DHIHs emanate from Manjushri’s heart and dissolve into your heart, bringing quick wisdom. 4. Then bows and arrows, swords and scriptures emanate from Manjushri’s implements and sink into your heart, bringing profound wisdom. 5. The wisdom of explaining. Scriptures and swords together (symbolic of Je Tsongkhapa) are emitted from his heart and dissolve into you like rain: you become very skilled at giving discourses. 6. Debating wisdom. Swords alone are emitted from his heart and dissolve into you like rain: you become very skilled in debate. 7. Writing wisdom. Scriptures alone are emitted from his heart and dissolve into you like rain: you become very skilled in composing and writing. It is very good to do these visualizations bringing these seven different types of wisdom. (b) Then Avalokiteshvara comes from the throat of Je Tsongkhapa and dissolves into you„oall defilements of speech are eliminated and you should feel inseparable from Avalokiteshvara. You and all other sentient beings are able to generate boundless compassion, equalizing self with others and bodhicitta in immaculate form. (c) Then, visualizing ambrosia and rays coming from Je Tsongkhapa’s crown, throat and heart, Vajrapani comes from the heart of Je Tsongkhapa and dissolves into your heart and the hearts of all sentient beings„oall your defilements of mind are eliminated and you should feel inseparable from Vajrapani. You and all other sentient beings become influential and powerful enough to do extensive work for all sentient beings. If you know how to apply the teachings really skillfully, you can interchange the purposes. For example, if you are practicing in order to collect possessions, visualize that rays in the form of hooks emanate from the heart of Je Tsongkhapa and go in all directions, pulling back to you whatever it is that you desire. For more influence, use red color. 1. If your practice is mainly for pacifying (shi) diseases or demonic impulses, white rays are emitted from the heart of Je Tsongkhapa. They pacify and eliminate the diseases. 2. If your practice is mainly for increasing (gyä) your longevity or virtue, yellow rays are emitted which dissolve into you, increasing your life span or virtue. 3. If your practice is mainly for special empowerment (wang), red rays in the form of hooks are emitted from the heart of Je Tsongkhapa, go in all directions and dissolve into you, cleansing your defilements. Then red rays are emitted again and, as a magnet attracts metallic substances, whoever you’d like to influence is brought just there, right before you. If you wish to influence the king, for example, the rays bring him into your presence, bowing before you in reverence. 4. If your practice is for eliminating interferences (tra)—internal or external—blue rays are emitted from the heart of Je Tsongkhapa and eliminate the interferences. If you wish to accomplish any work in the universe, visualize that green rays are emitted from the heart of Je Tsongkhapa and that whatever project you want is efficiently accomplished. Green is of the nature of the wind element. Like when a green flag is waved, the train moves. Wind has the power to bring growth of vegetation and so forth. Therefore, green is adopted for the accomplishment of purpose without effort. If somebody asks you for help, for example, if they are suffering in some way, you can do various practices for them. If somebody is suffering from fever, send cooling white rays; if the person is cold, send warm rays. In other words, depending on the condition, you send “antidote” rays. The migtsema prayer was originally written by Je Tsongkhapa in praise of his own teacher, Jetsun Rendawa, with Rendawa’s name in it—“tsug-gyän Rendawa.” But Rendawa sent it back, replacing his name with Lama Tsongkhapa’s—“tsug-gyän Tsongkhapa”—saying that he was not worthy and that it was Lama Tsongkhapa who really deserved it. Therefore, since it was first given as praise to Jetsun Rendawa by Je Tsongkhapa and then returned, this prayer in the form of making requests is very powerful. It is the King of Prayers or the King of Requests. It is the pith summary of all teachings and there are many commentaries on it. If you are doing this practice for your own sake, do it as above; if you are doing it for the sake of others, such as a parent or sibling, change yourself into the other person and then do it. Gyältsab-je and Khädrub-je dissolve into Lama Je Tsongkhapa. The throne, lions and lotus then dissolve into the sun and moon, but these two do not dissolve into Je Rinpoche. Your mind is in the lotus, in a bean formed by sperm and blood„oyour most subtle consciousness is within this. Je Tsongkhapa gets smaller and smaller in size until he is about the size of your little fingertip. He comes to the crown of your head. Your heart becomes an eight-petaled lotus, in which your mind is located. Je Rinpoche and the sun and moon disks come to the center of your heart. The sun disk dissolves into the blood and the moon disk dissolves into the sperm and Je Rinpoche dissolves into your most subtle consciousness. Instantly, a second Je Rinpoche with sun and moon disks appears„oas the first dissolves, the second appears, in the way water bubbles appear immediately„oas soon as one dissolves, another appears; as rain falls into the sea, another drop immediately splashes up. It’s the same as that. This is very important: we do have the potential to become Buddha, to become Lama Je Tsongkhapa. When Lama Tsongkhapa dissolves, in the next instant a new one appears, inseparable from our mind. When our mind is purified we become Lama Je Tsongkhapa. Your mind and your guru are inseparable: this is very important here„o the moment Je Rinpoche dissolves into your most subtle consciousness, the other appears and both are of the same nature. The eight petals of the heart-lotus close up: the interior is very smooth, like a precious substance and full of illumination; the nature of illumination. The closed petals are tied by a white rosary of the sixteen Sanskrit vowels in a clockwise direction, and below that tied by a red rosary of the thirty-four Sanskrit consonants in an anticlockwise direction. These two rosaries have thus divided the closed lotus into three parts, each of which is surrounded by the mantra—OM AH RA PA TSA NA DHIH—in white, red and blue, respectively. At the top of this lotus heart is a white, five-pronged vajra with a blue HUM at its center. From the tip of the vajra a small shaft of white light emanates upwards and passes out the crown of your head. This connects directly to the heart of Maitreya Buddha. This visualization creates special karma to be reborn in Tushita right after death. This is the best method of achieving this result. You should always think that this rainbow-like shaft of white light is connected in this way, even when you’re asleep. In a southerly direction from one’s place is Mt. Meru, with its four levels. At the top are the gods of the thirty-three. Then there are the seventeen stages of the world of form. Gradually going higher in space there is a realm called Thabträl, which is devoid of war; the asuras cannot go there. Then above that is the realm called Ganden, which is like a city. Again, above that, like a place of solitude, a monastery in space, is the pure realm from which the thousand buddhas of the fortunate eon descend. So this Ganden that is like a city is again the samsaric gods’ realm and is not the Ganden in which we try to be born. We try to be born in the monastery-like Ganden from which the thousand buddhas descend. It is bodhisattvas who are born in the pure Ganden. They are not necessarily out of samsara but are free of true suffering. This is a pure place shown by all the bodhisattvas who received bodhicitta in that life. It is of the nature of jewels, as even as the palm of your hand and very blissful; free of stones, thorns and so forth…all ugly things. The ground is very resilient. The base is golden and decorated by lapis lazuli eyes. Serkong Tsenshab Rinpoche described this as akin to buildings made of wood and cement: between these basic materials are decorative pieces of various other materials, carved wood and so forth. There are many beautiful shrubs, flowers, fruits; it is very attractive, with many ponds, large lakes and big trees. There are various beautiful attractive birds above and around the lakes and ponds, which contain only jewel sands. Those beautiful birds continuously proclaim the Dharma in very attractive, sweet tunes and sound. The whole place is full of beautifully scented smells. It is such that simply bringing it to mind makes great happiness arise. In the center of this pure realm that has complete perfections and enjoyments is a very high Dharma palace and a room called the chamber of the very high banner. (Sim-khang means bedroom, an honorific word for important people’s room; it does not mean a place to sleep). Inside that there is the kun-ga ra-wa (the fence that pleases all), which literally means bookshelf. In the monasteries there are the very big bookshelves. Here, it means a place for giving teachings. So, in front of that the palace, the chamber of the high banner, is the place where Maitreya gives teachings, the kun-ga ra-wa yi-ge chö-dzin. All this should be visualized as attractive and beautiful as possible, arousing in you the desire to be there instead of here. Visualizing this makes you see your own house, possessions and so forth as ugly and undesirable, so you want to renounce them. One of the causes of rebirth in the pure realm of Maitreya is the constant thought, day and night, even when you are working, that there is a tube of light connecting the crown of your head to Maitreya’s heart; constantly visualize that you are connected in that way—the tube of light, which actually goes on down to your heart, is connected to your own mind at one end and Maitreya’s at the other. Thus, whenever death occurs, you can transfer your consciousness. When you practice, send your mind up and down the tube. Don’t visualize a hole at the lower end: the mind is inside here, in the form of light as a bean or sesame seed. This is the main essential practice of transferring your mind to the pure realm. By remembering this all the time, if death suddenly comes, you will remember to spring your mind up the tube. Of course, it goes without saying that your great desire to be born there is only for the benefit of all sentient beings.